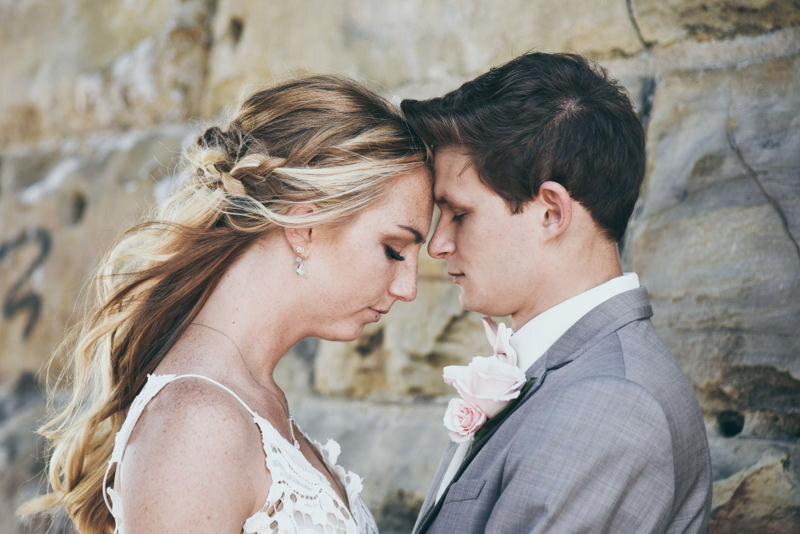 Megan and Ben were another amazing couple to work with! 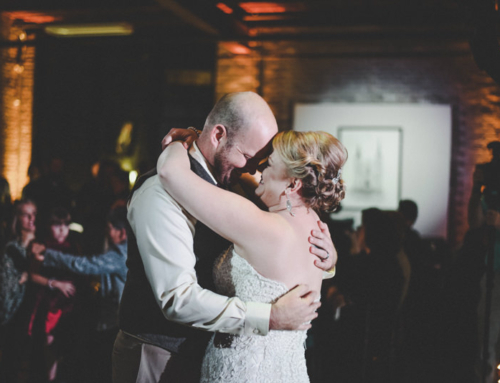 They had a pretty full service wedding with invitations, tuxedos, photo, floral decor, late night pizza and more! 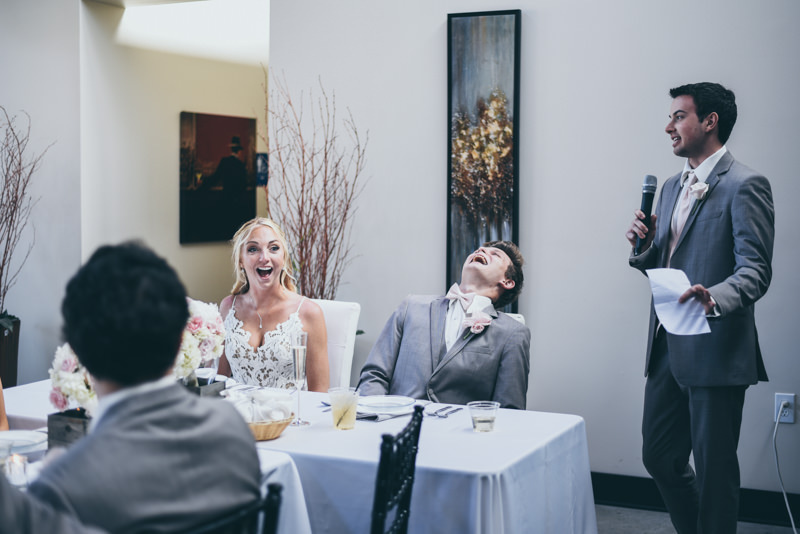 We really had a blast with them. 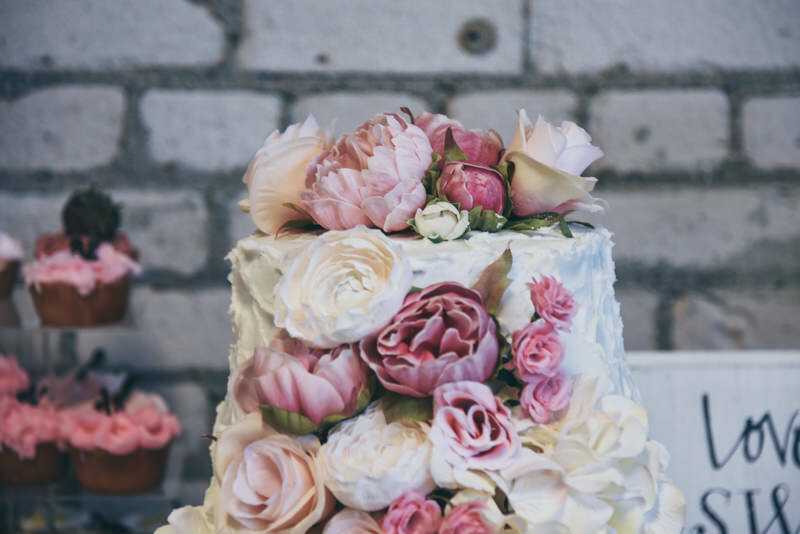 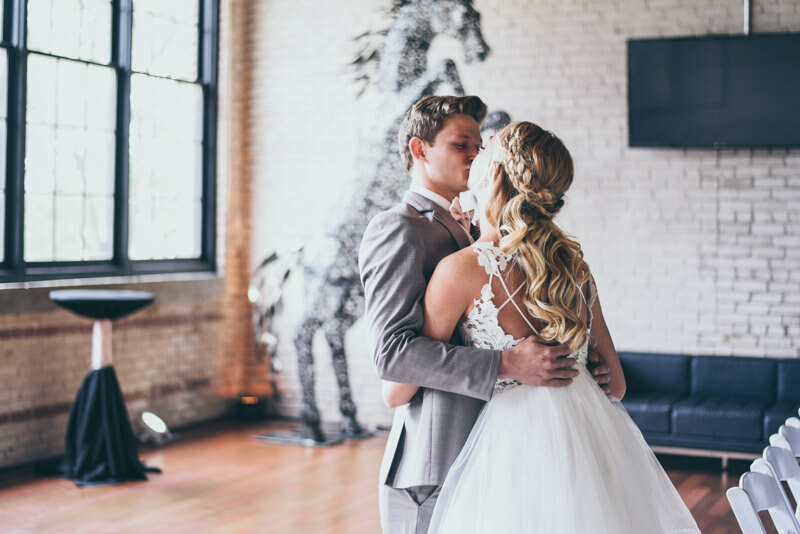 It was a very unique wedding full of special ideas and moments. 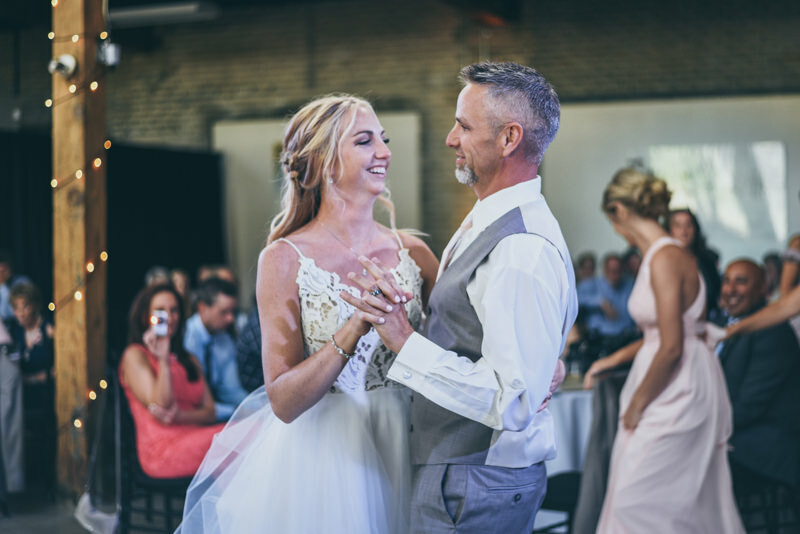 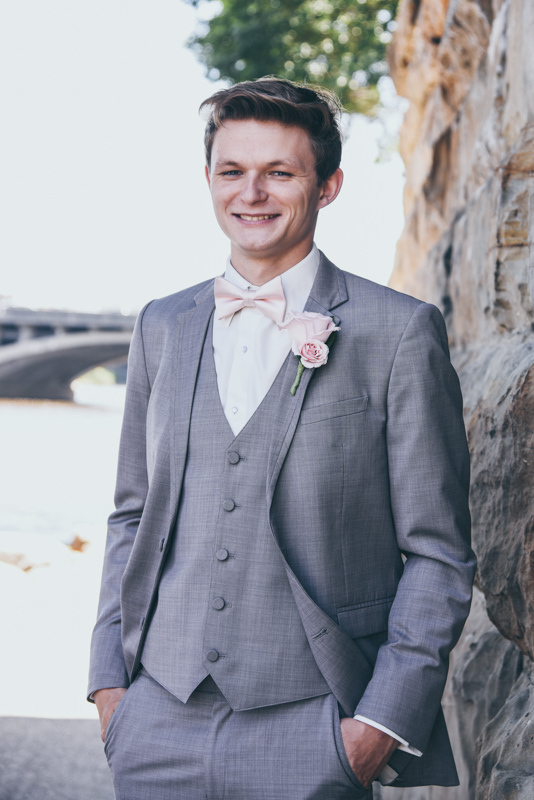 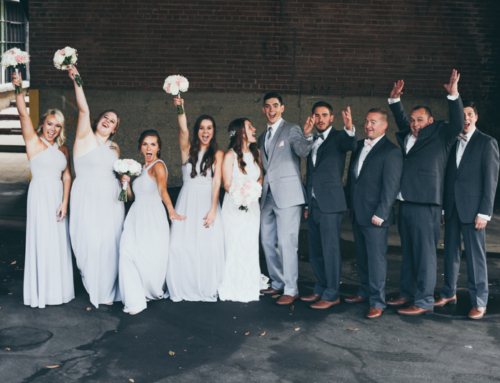 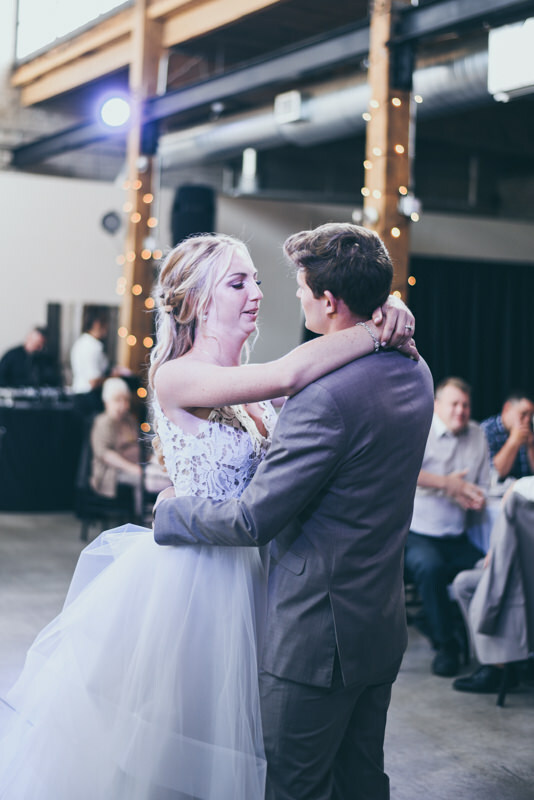 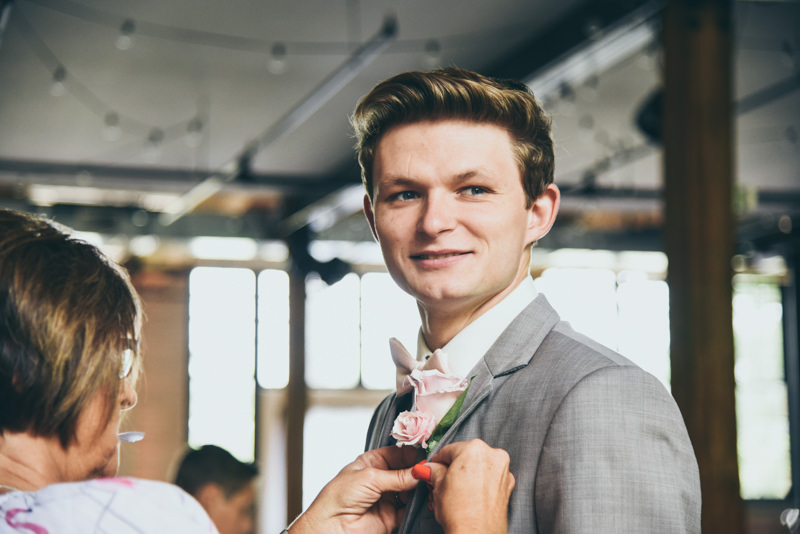 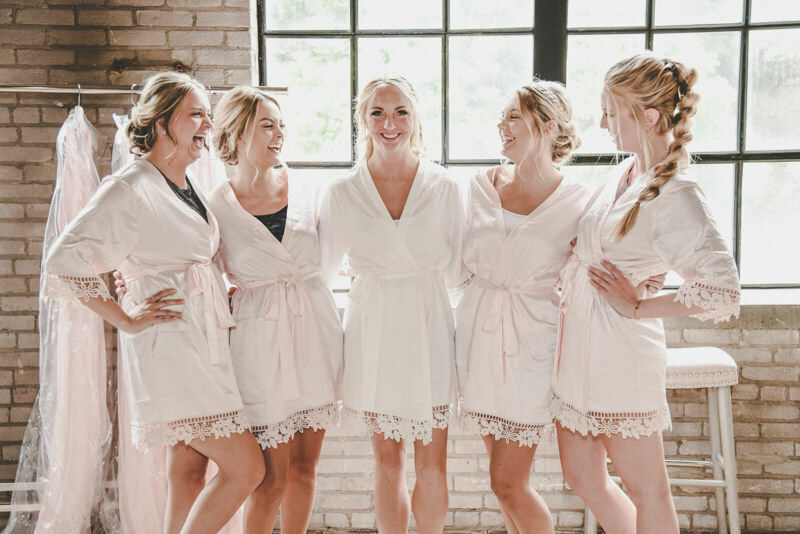 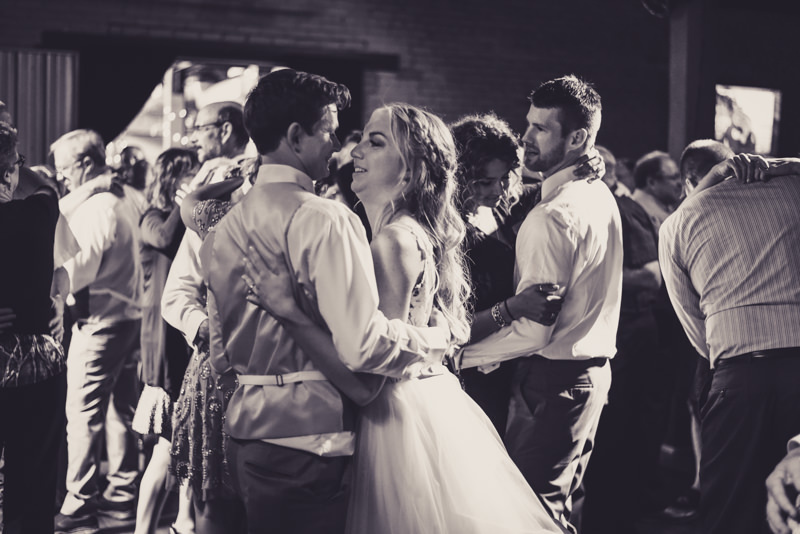 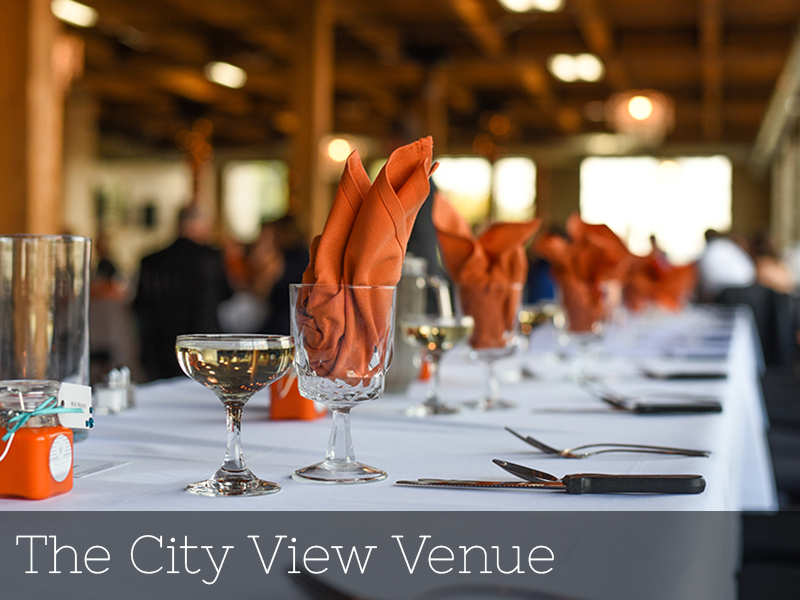 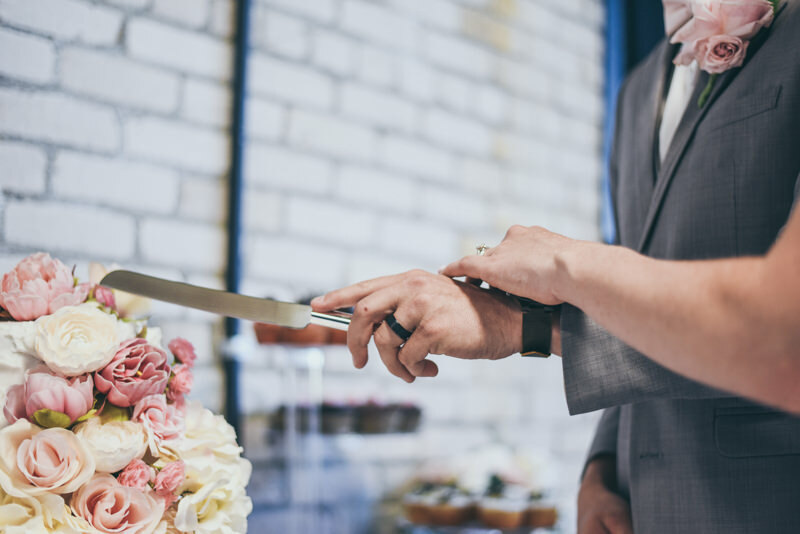 (Hey, if a groomsman jumps in during the garter removal and tricks the groom…and the group is crazy awesome at line dancing, what more could you ask for?!). 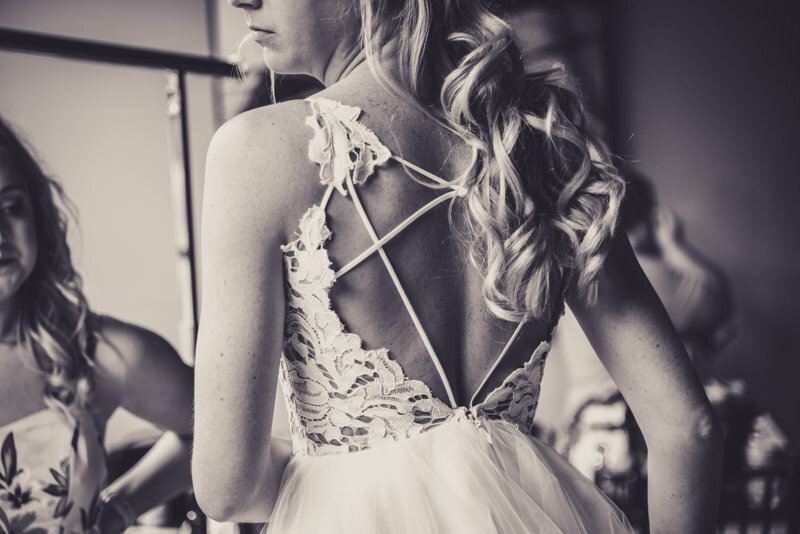 Megan was able to use our newest dressing room at our 401 Hall St location to get ready. 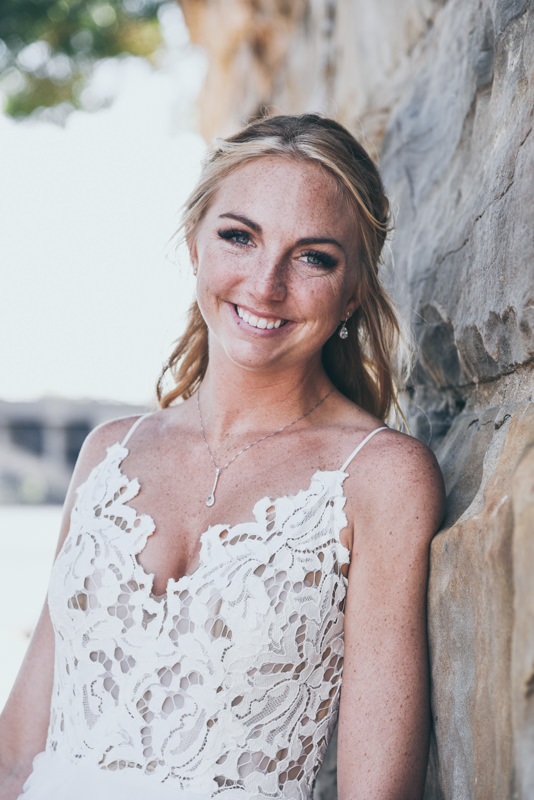 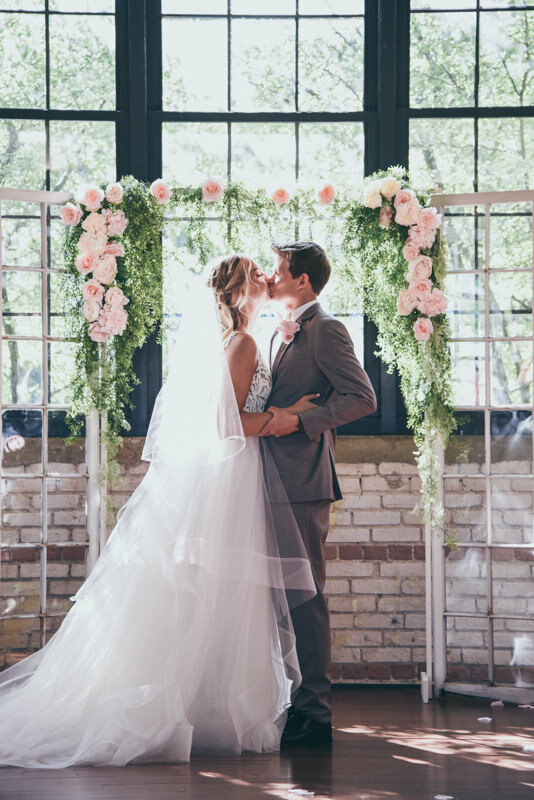 We LOVED her dress; the lace, color, and design were just perfect! 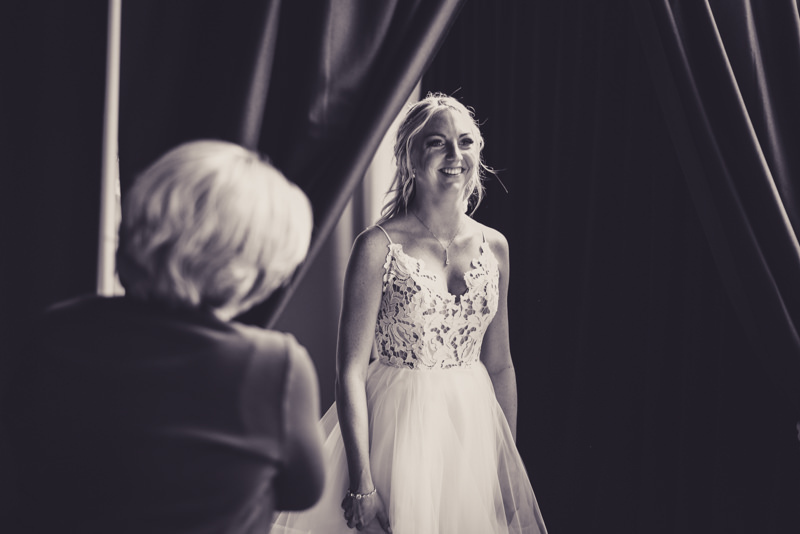 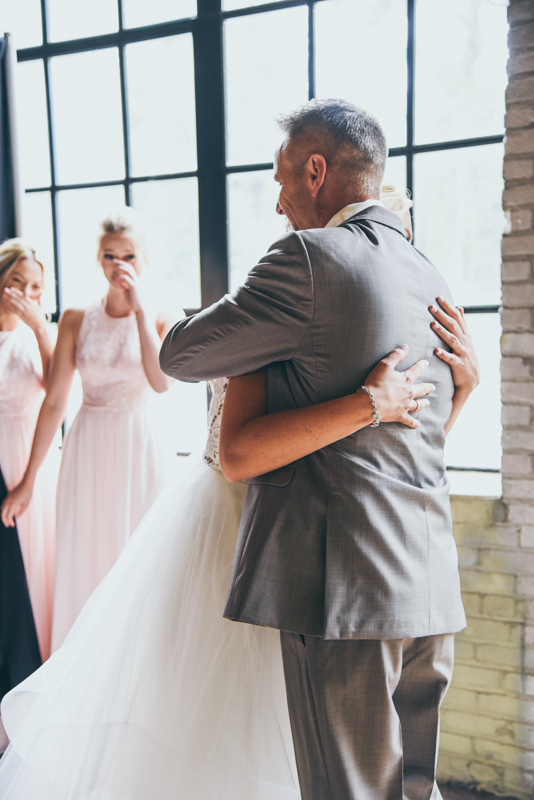 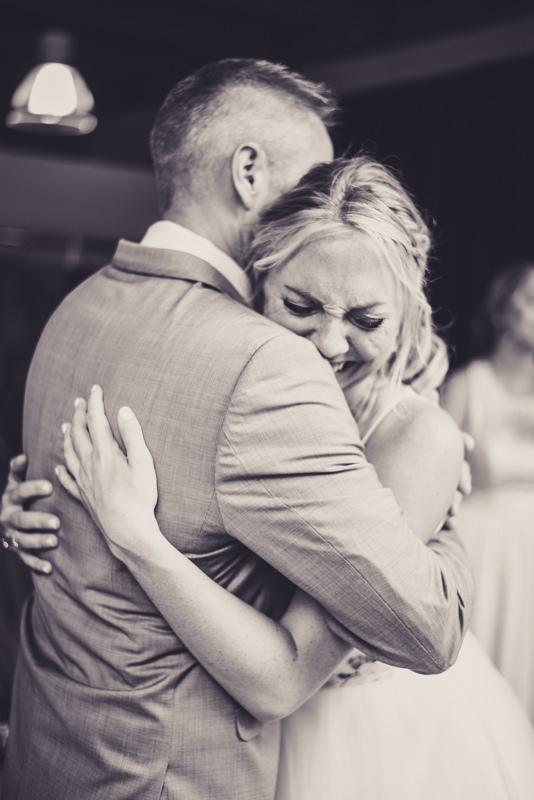 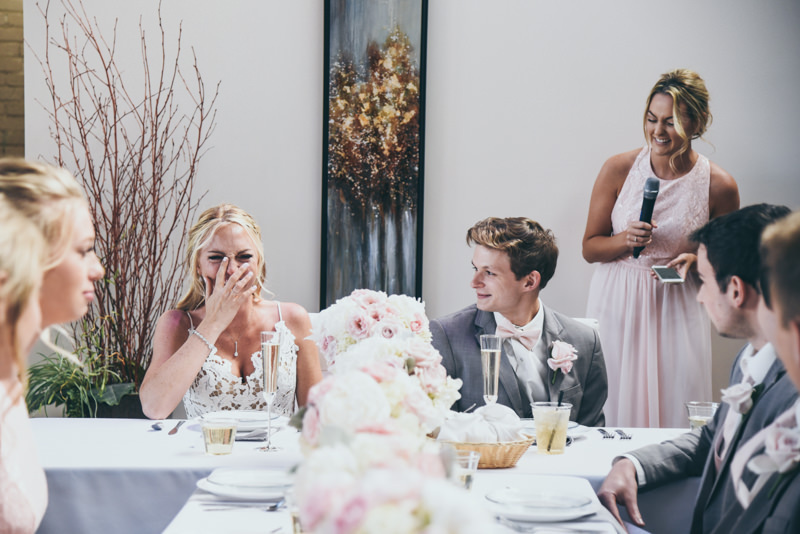 There were so many happy tears, especially when Megan did something unique, she had first looks with her bridesmaids, her dad, and then with Ben! 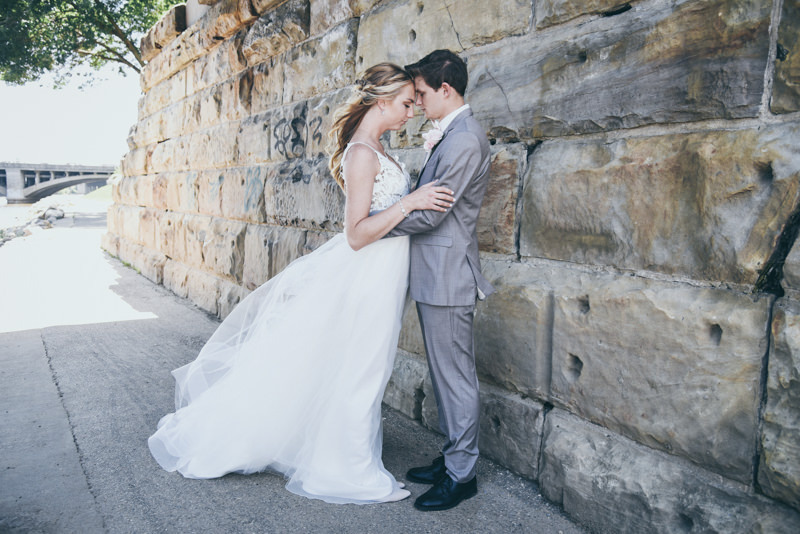 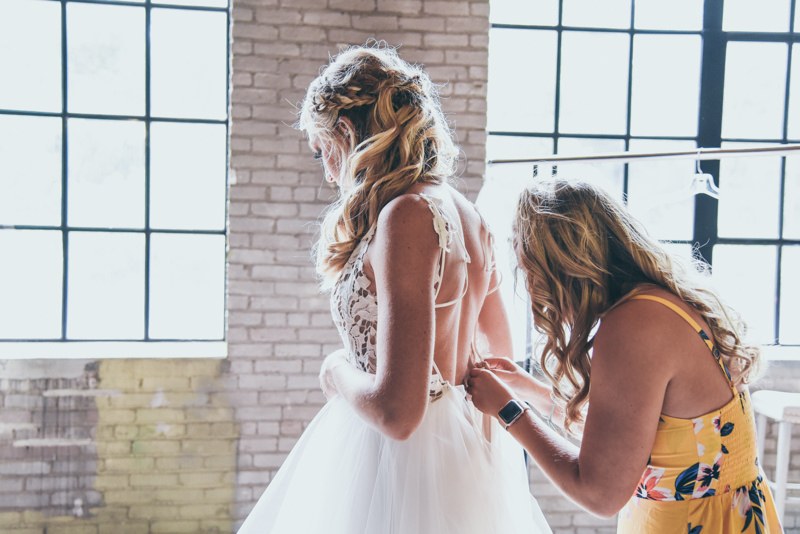 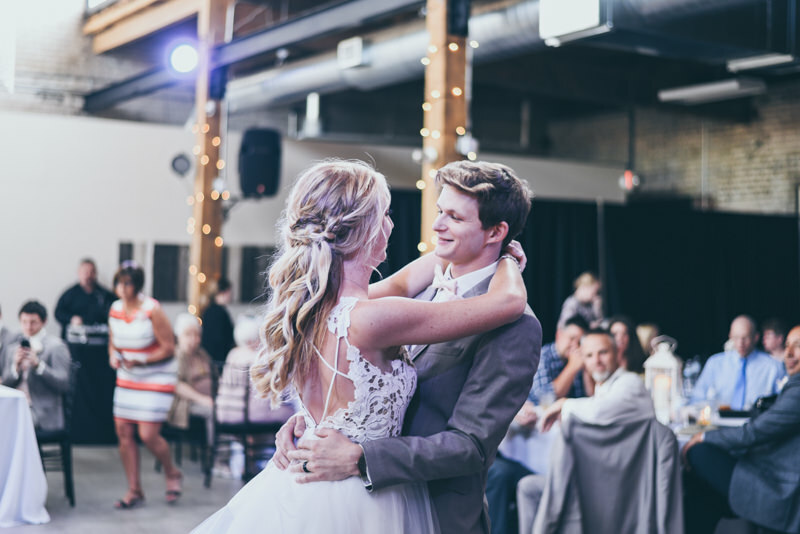 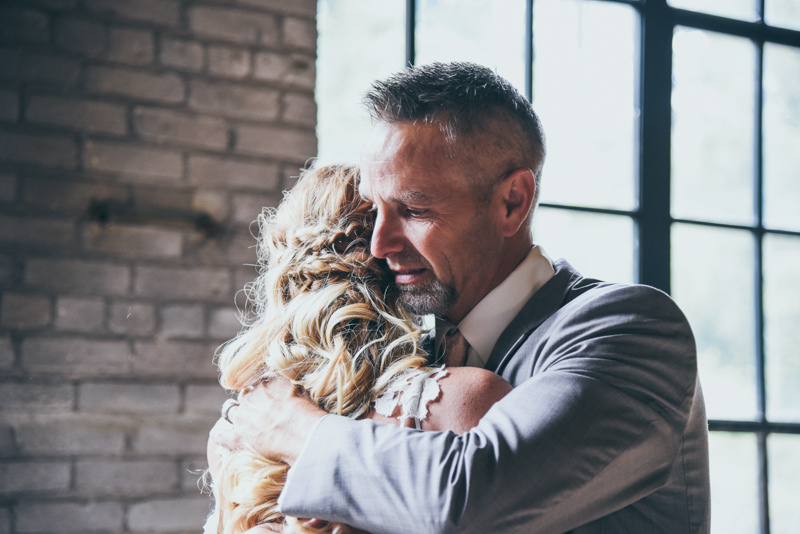 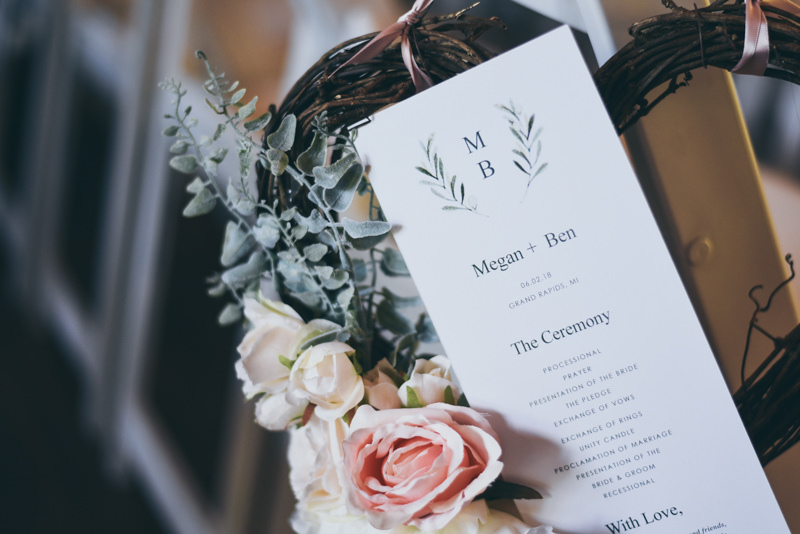 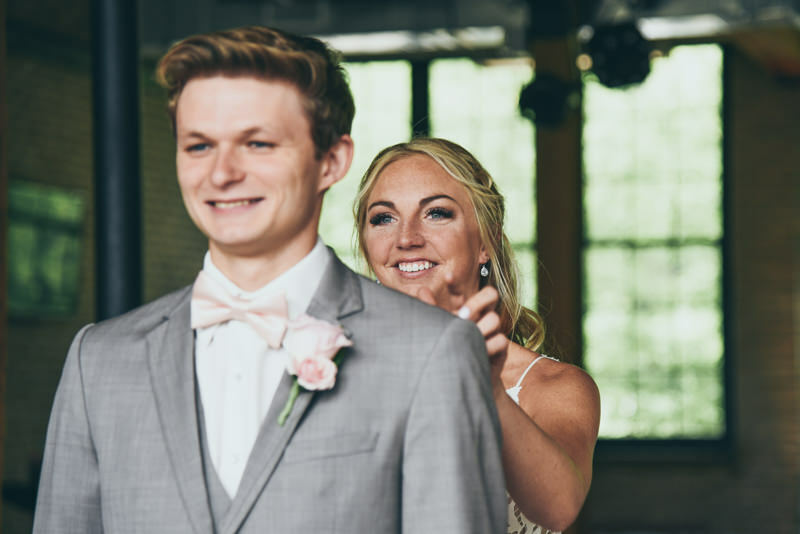 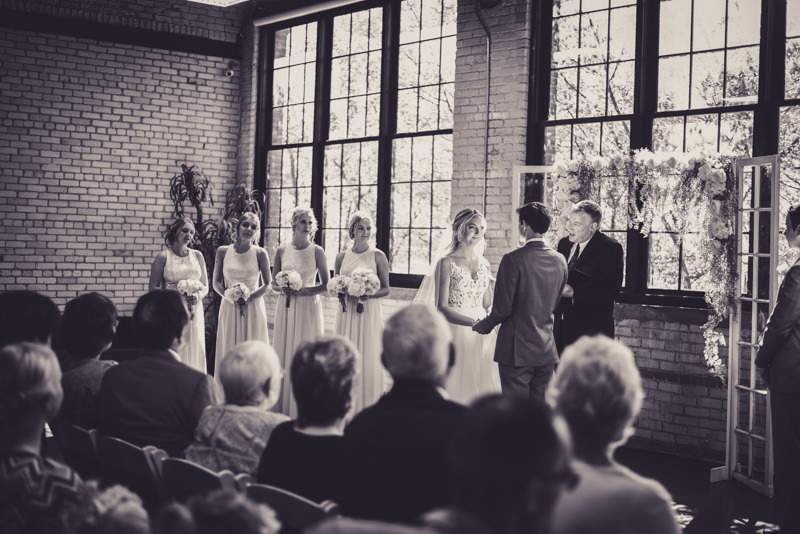 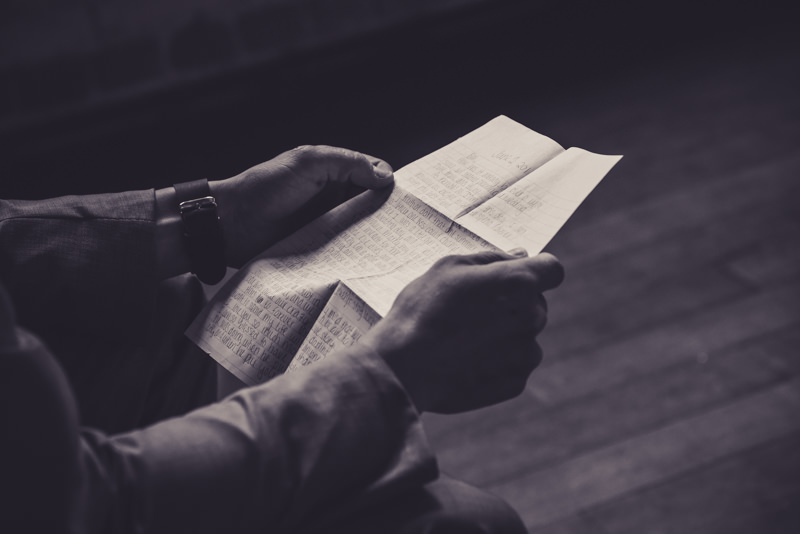 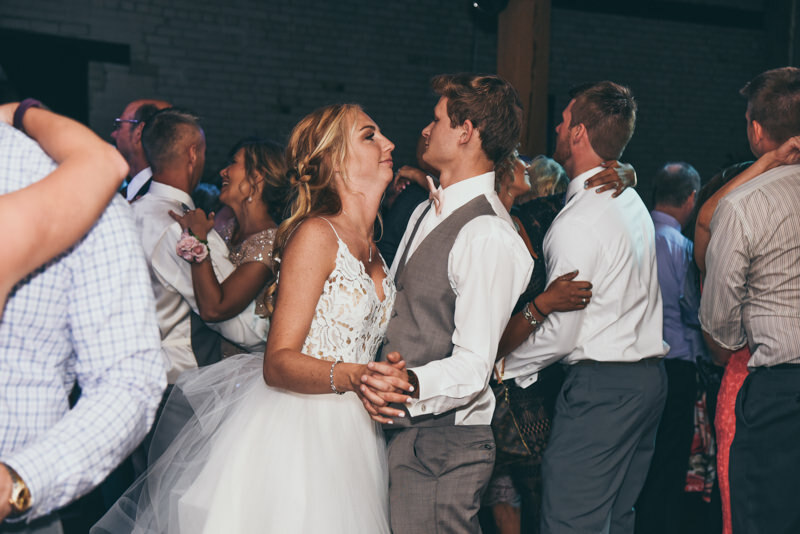 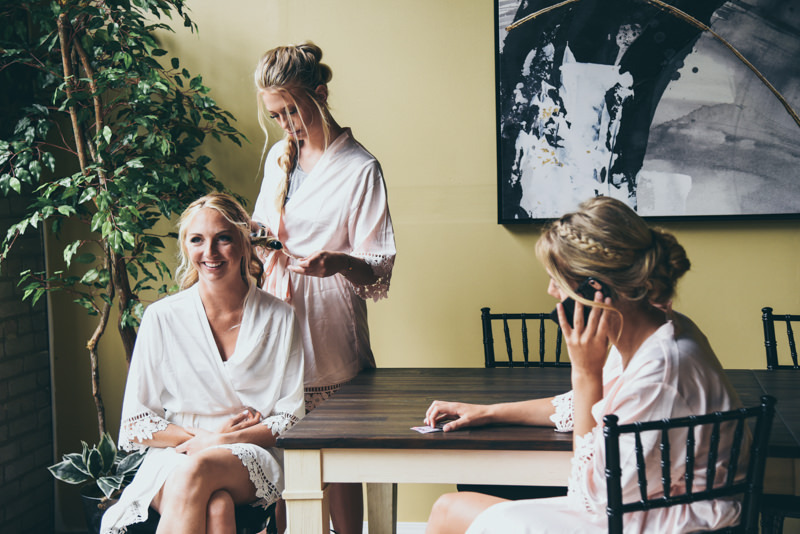 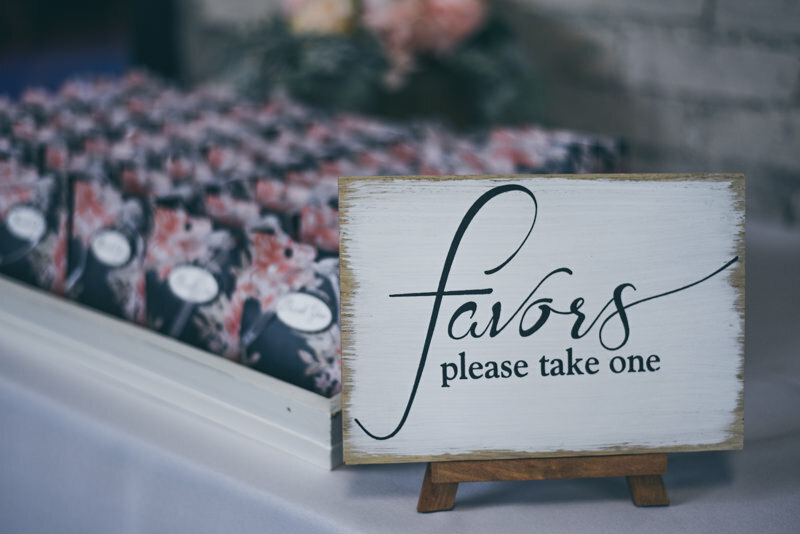 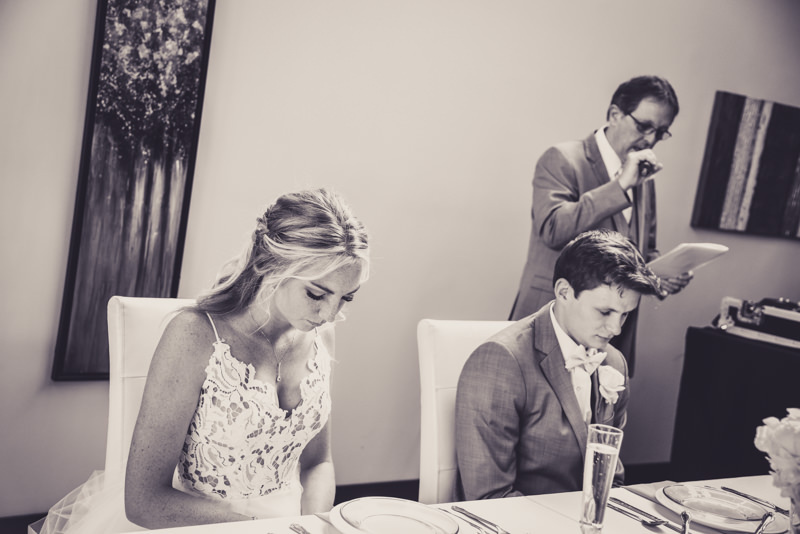 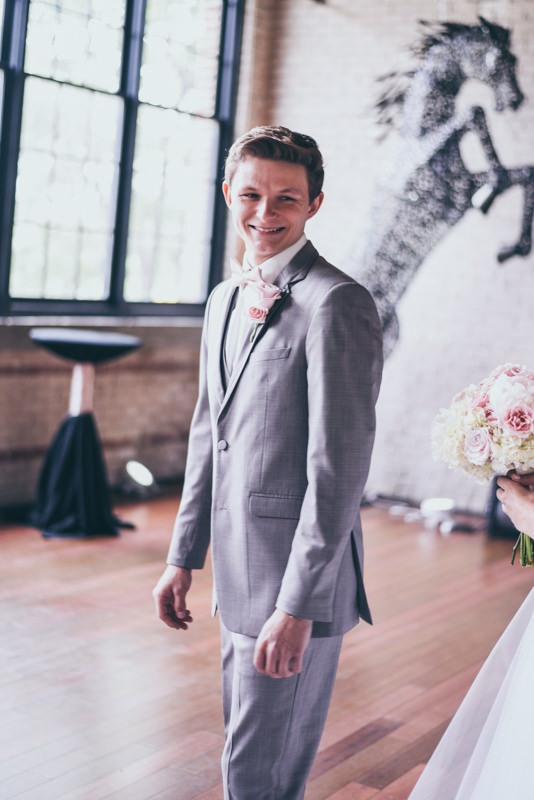 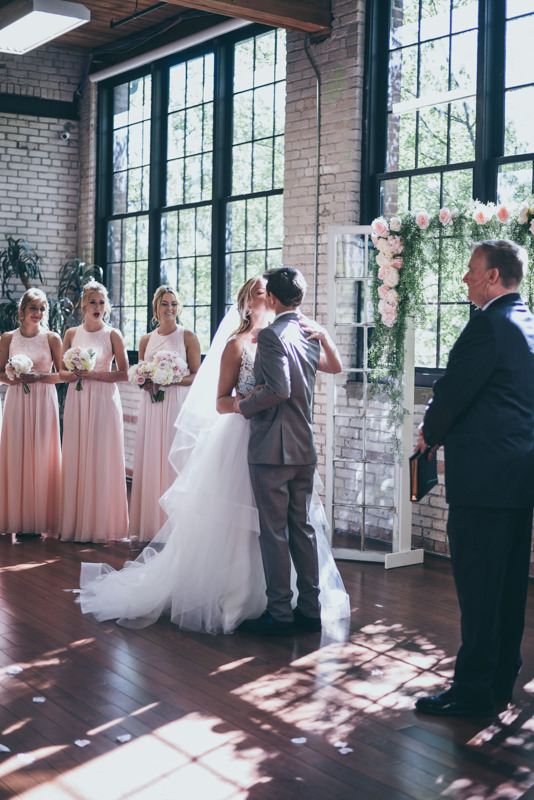 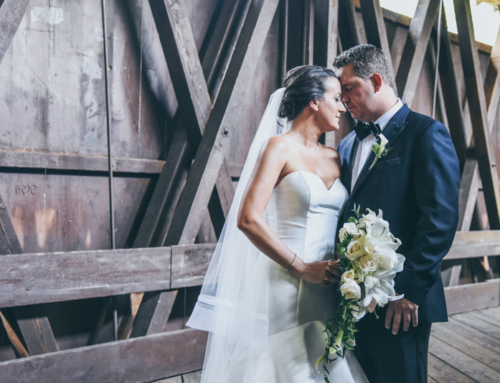 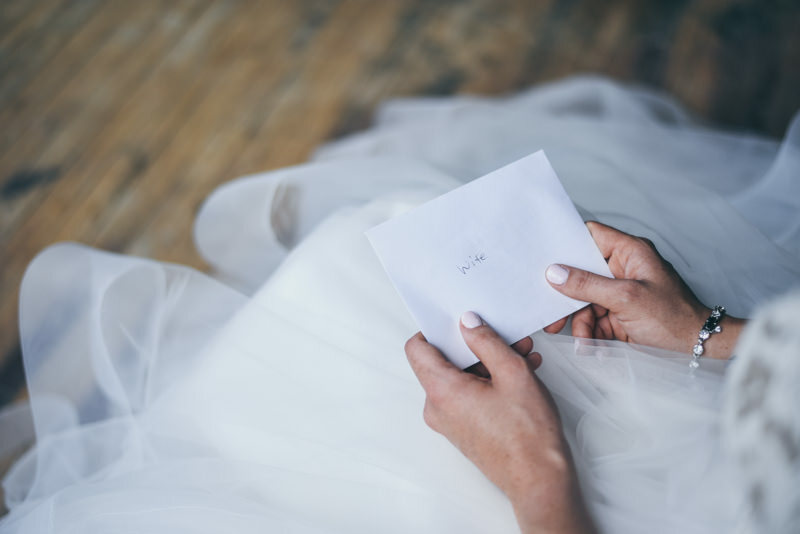 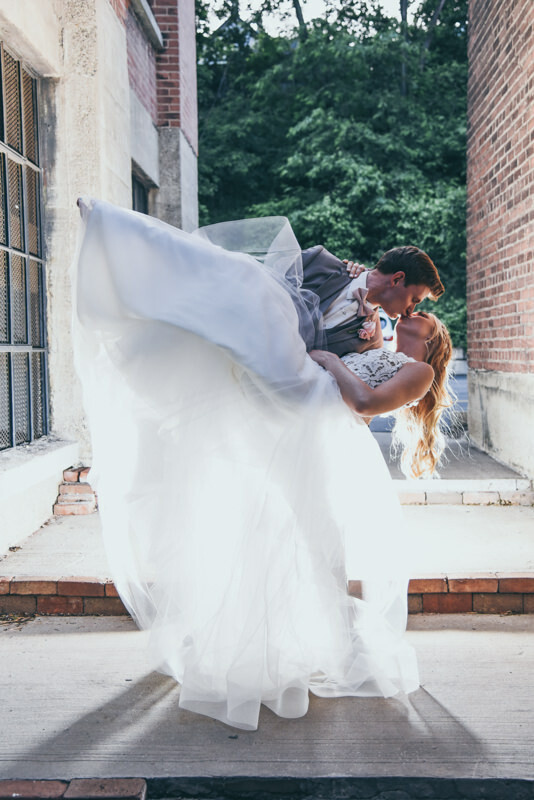 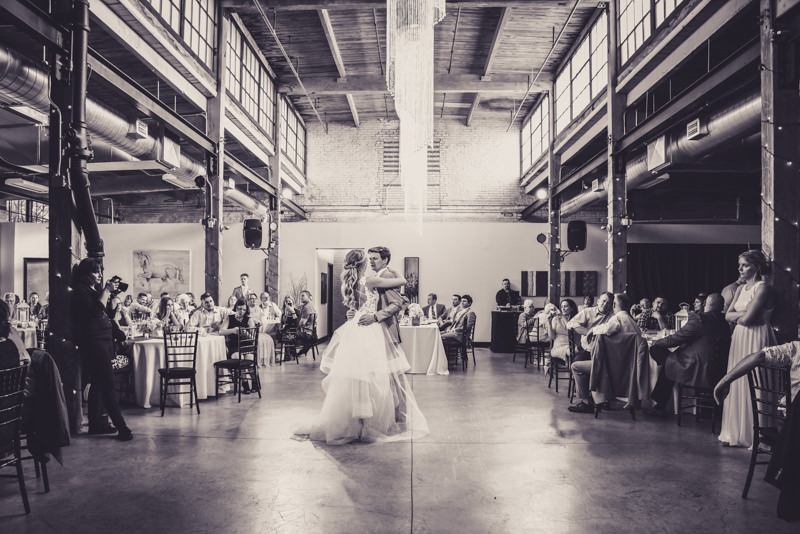 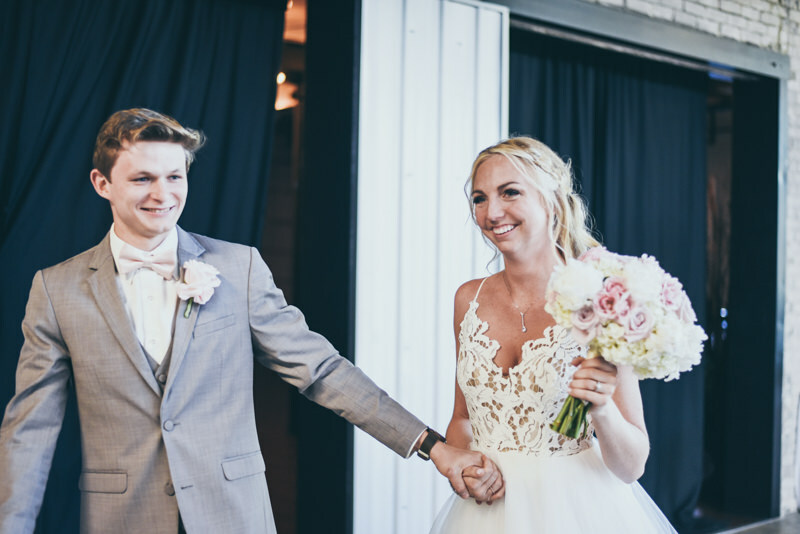 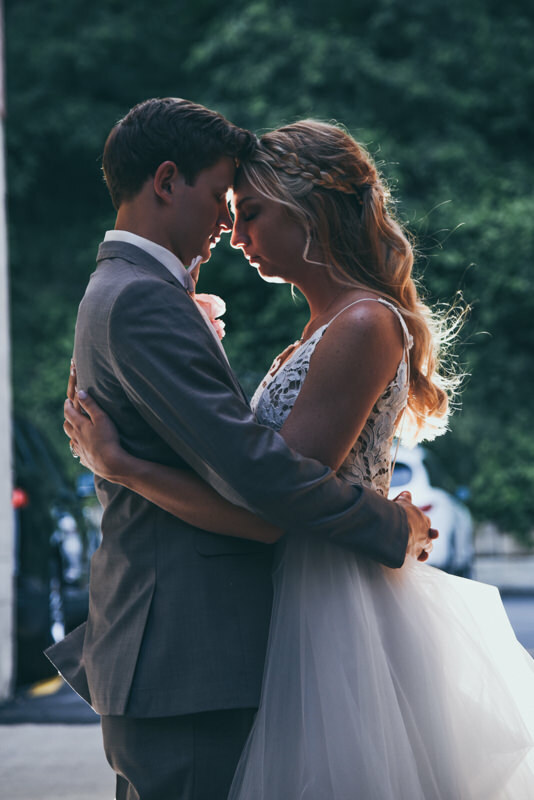 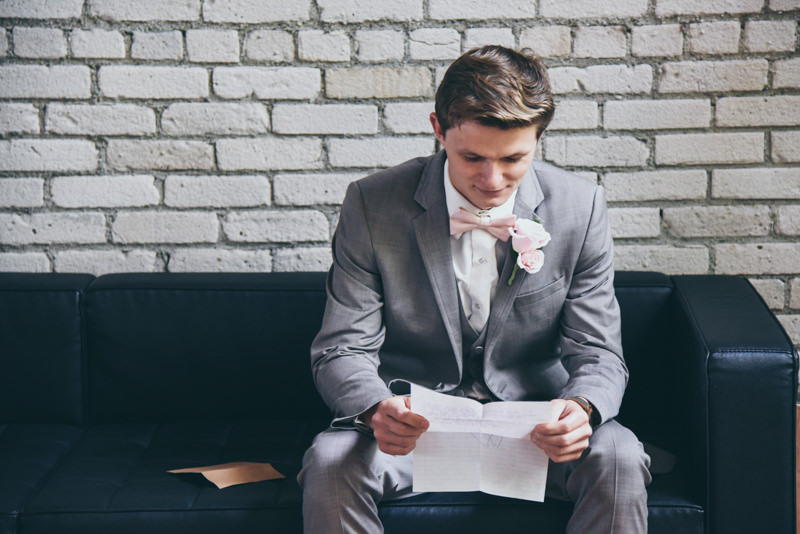 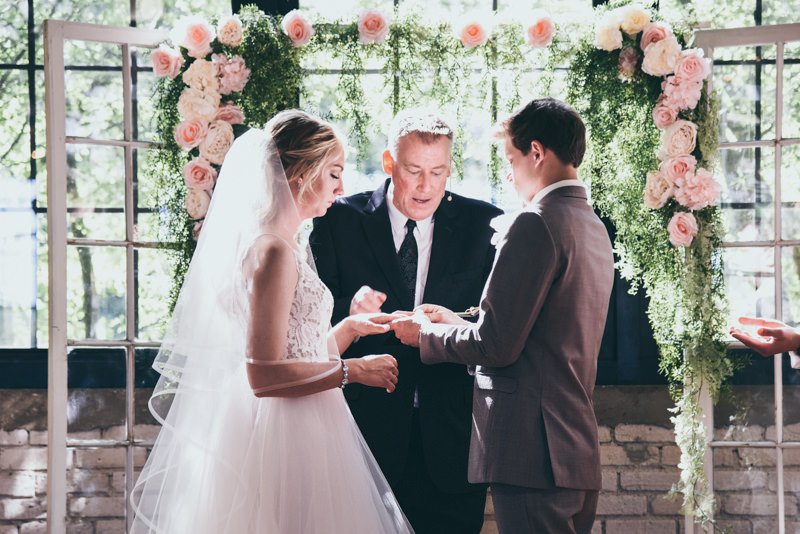 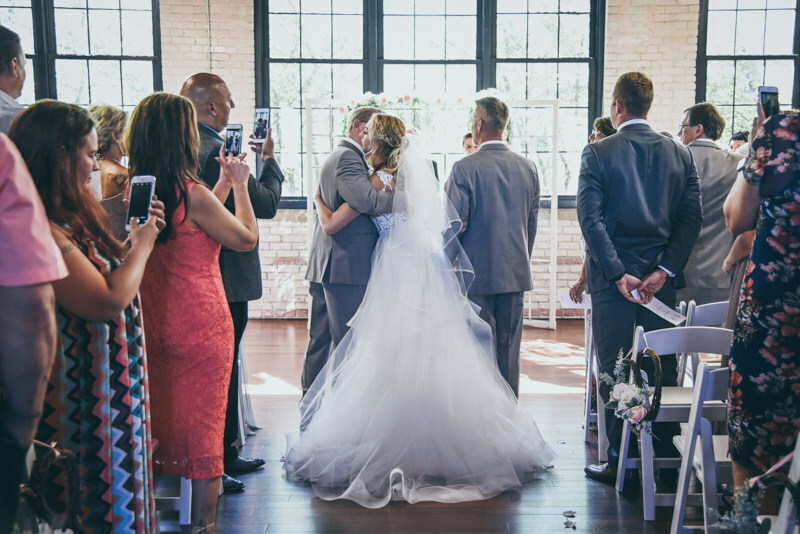 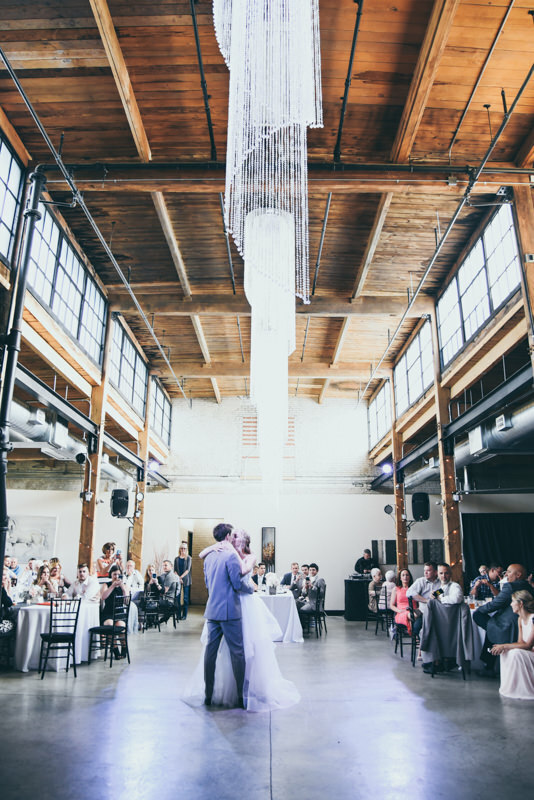 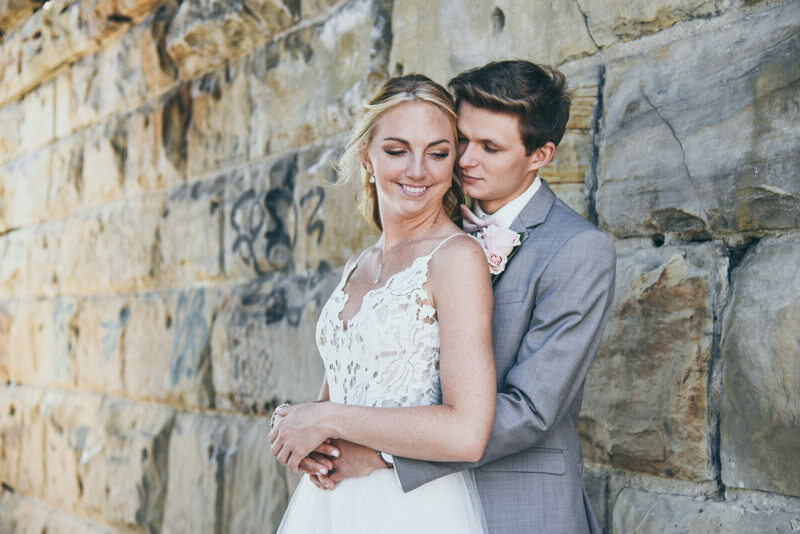 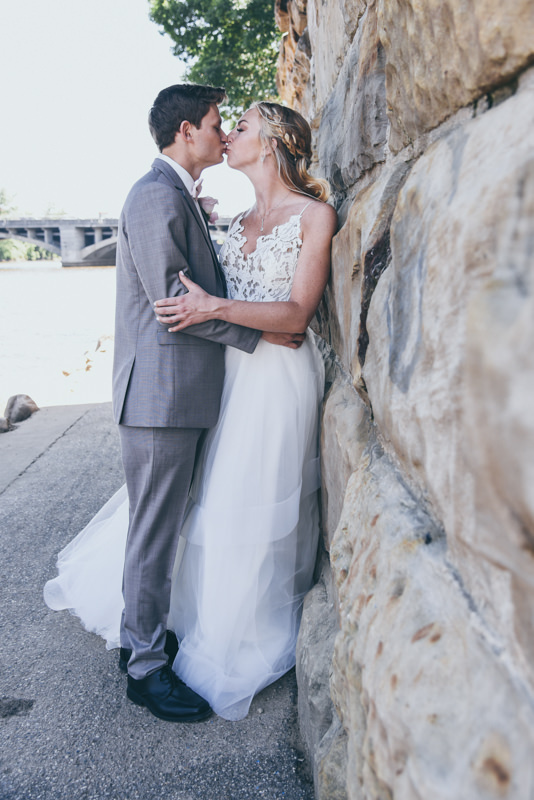 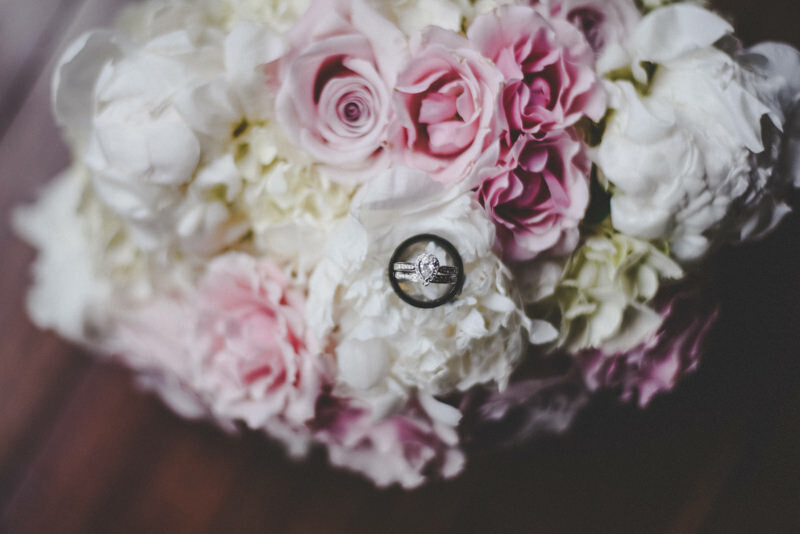 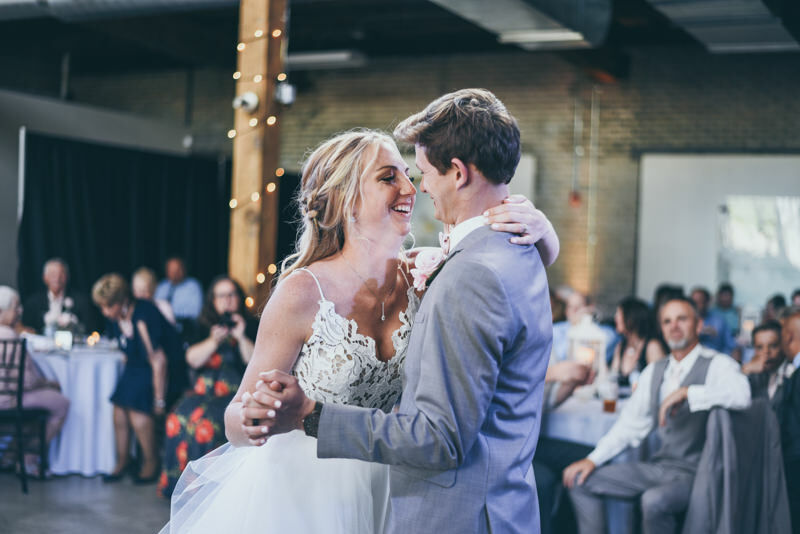 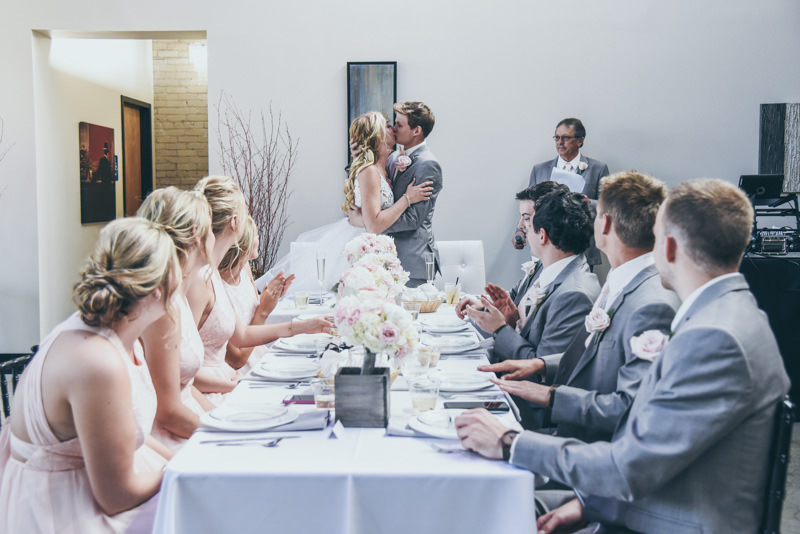 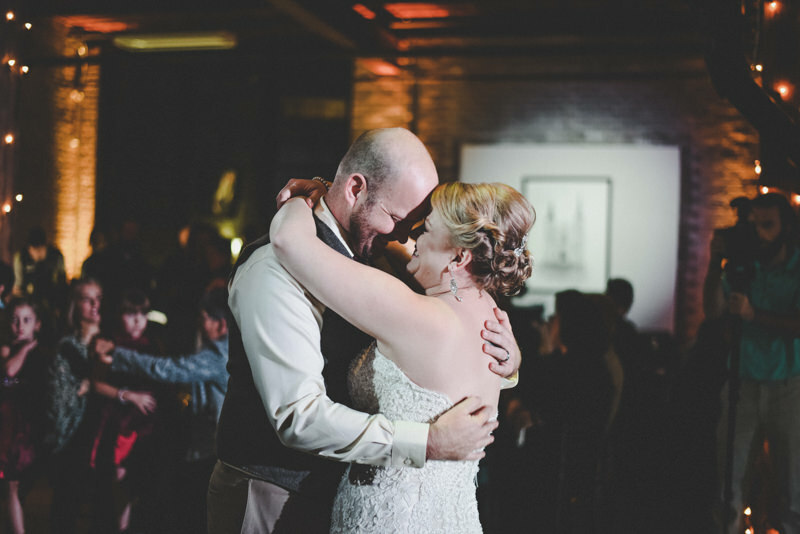 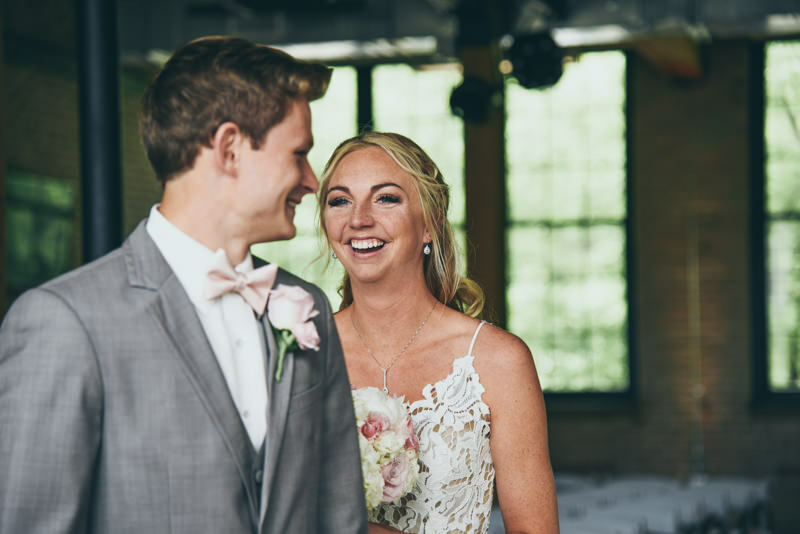 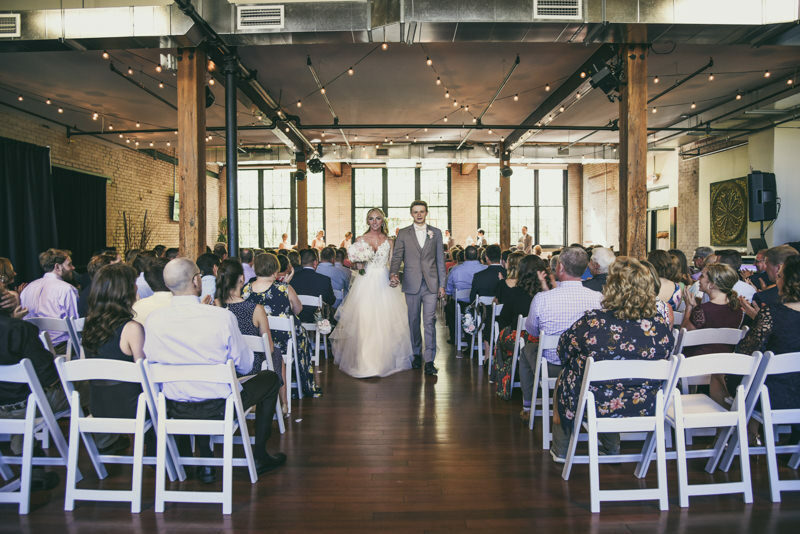 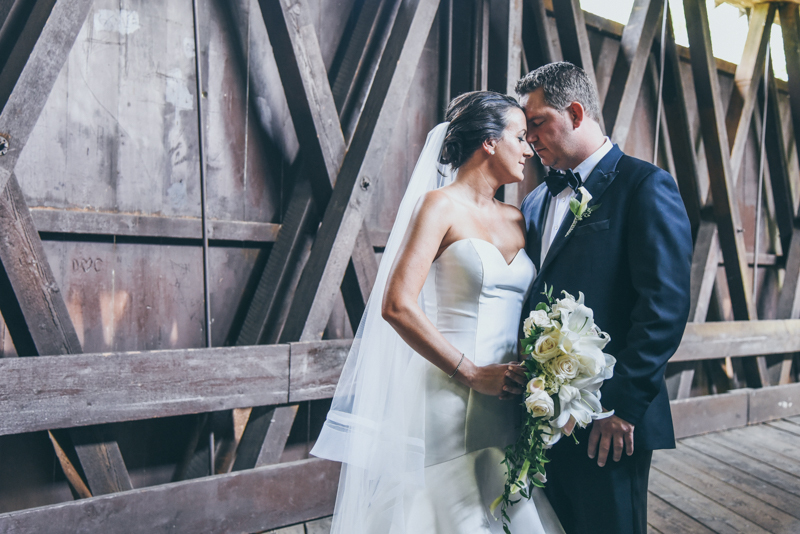 Megan and Ben wrote letters to each other to read before the ceremony, and it just seemed like everything was planned to make sure each moment was special and savored. 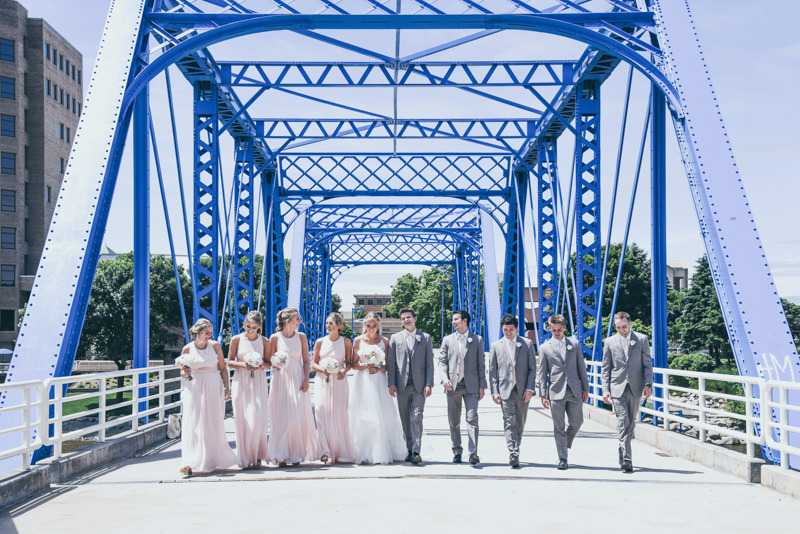 Megan and Ben and the bridal party took a jaunt to the Blue Bridge, we grabbed a few photos on the bridge, and under it. 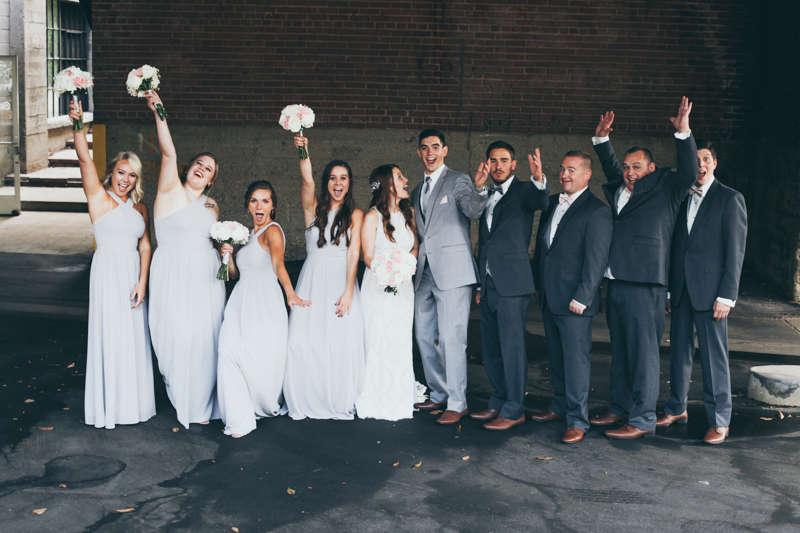 The bridal party fun photos were easier to do on the lawn by the Public Museum. 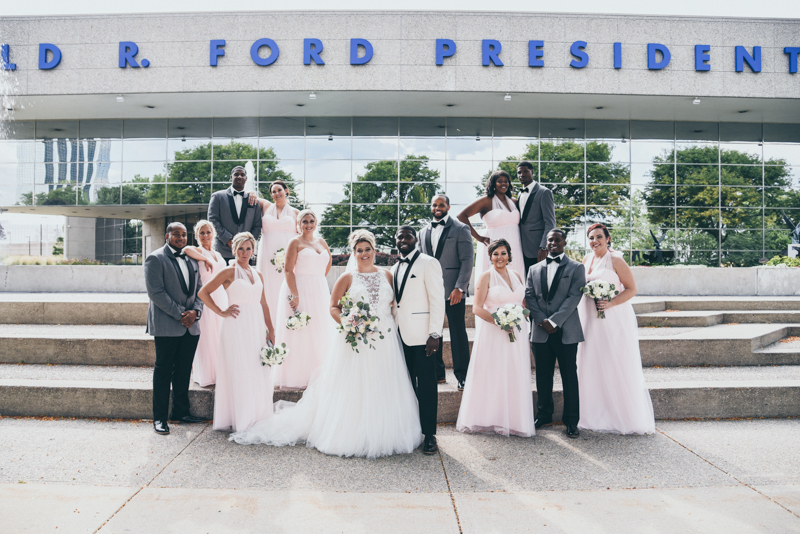 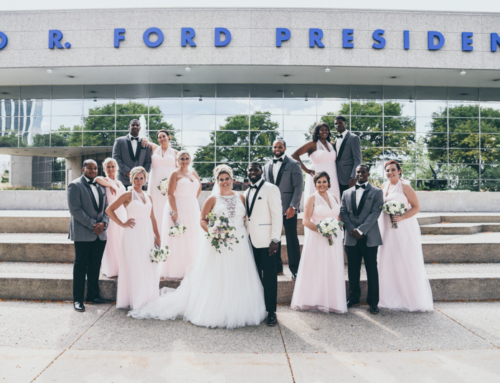 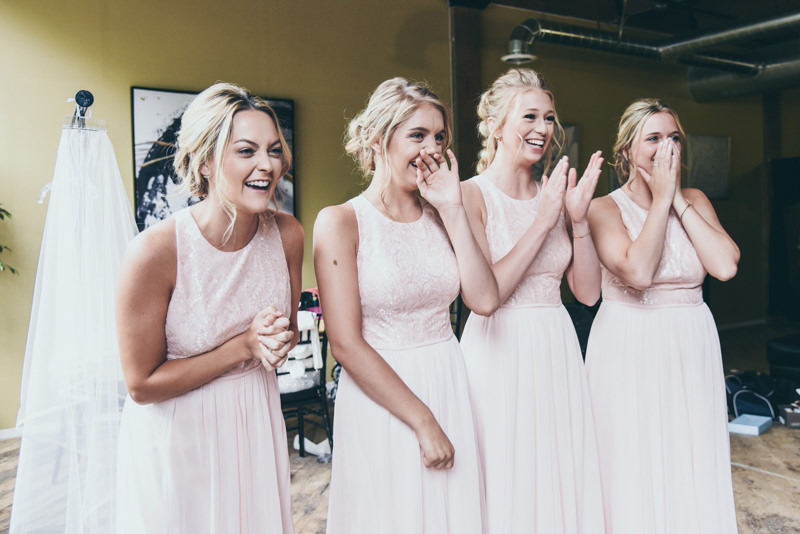 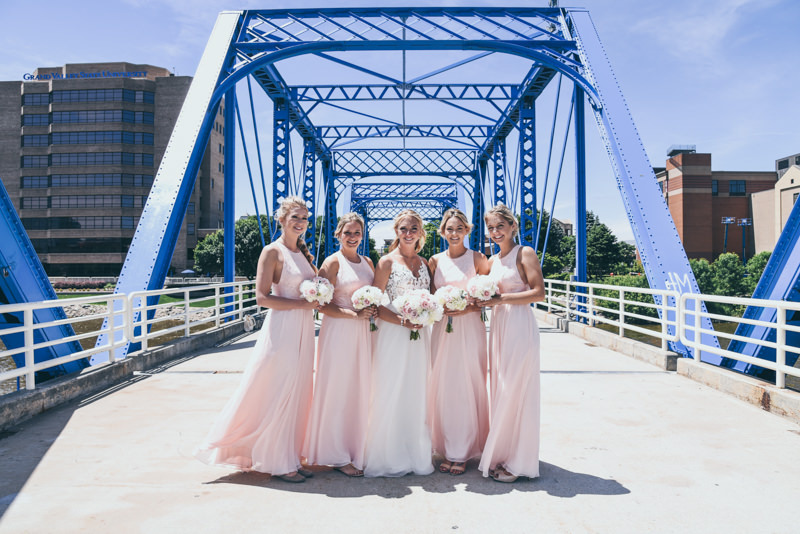 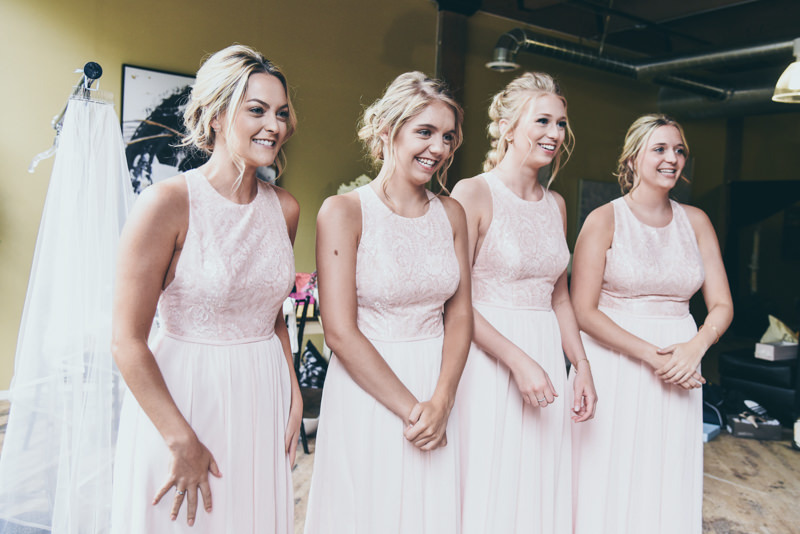 The ladies looked amazing in their pink gowns combined with the men’s tuxes…the guys were the first to get to wear our Sandstone Allure tuxedos! 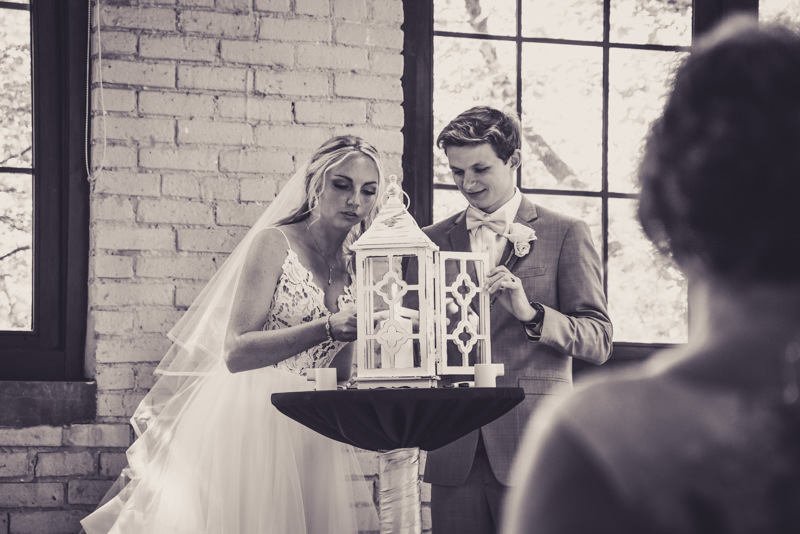 Megan and Ben had a perfect ceremony! 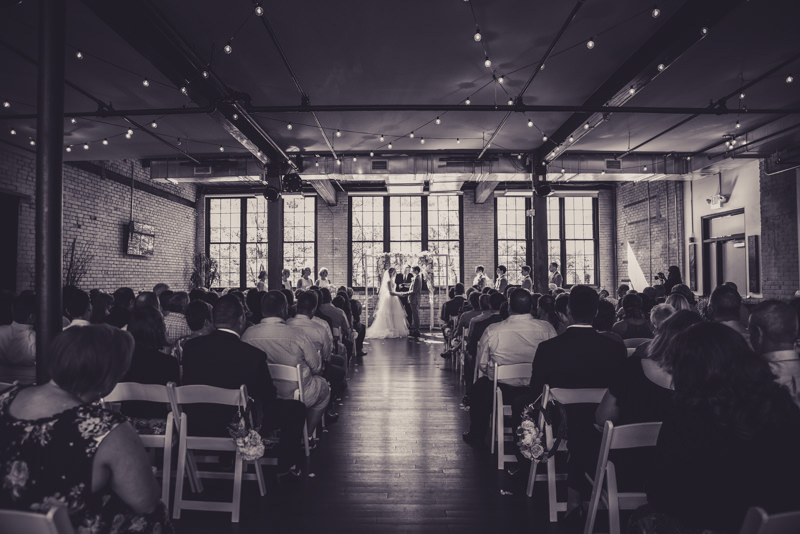 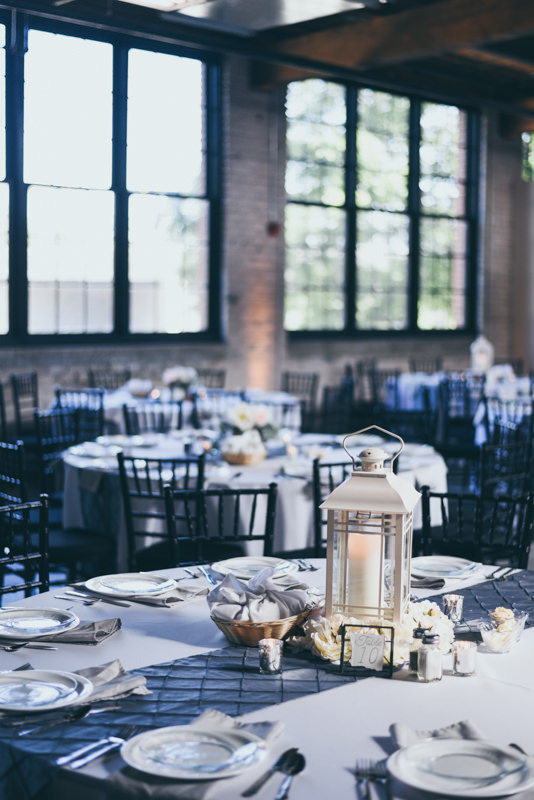 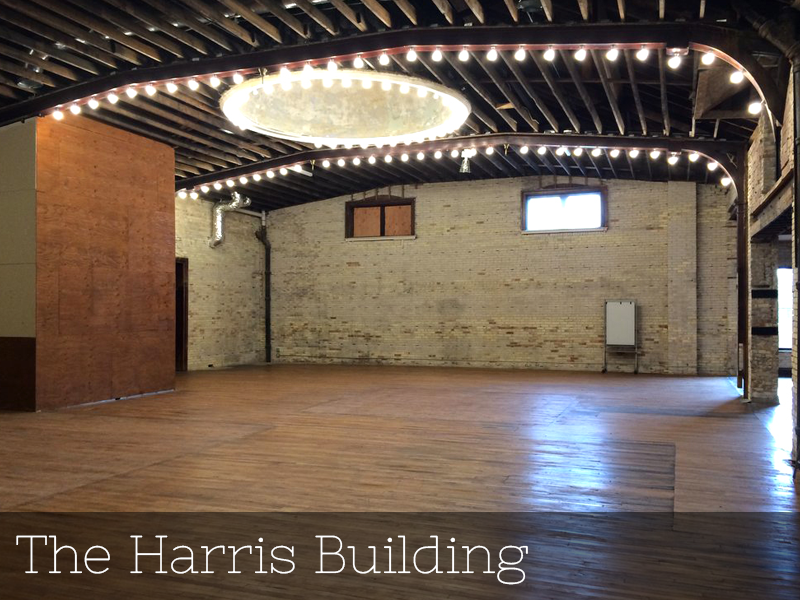 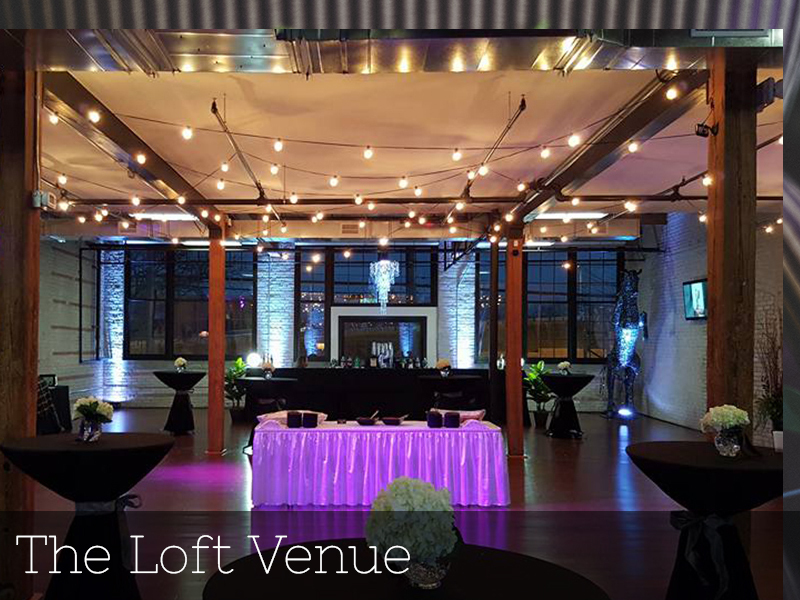 The lighting was just right in the venue and shined through the big windows they stood in front of. 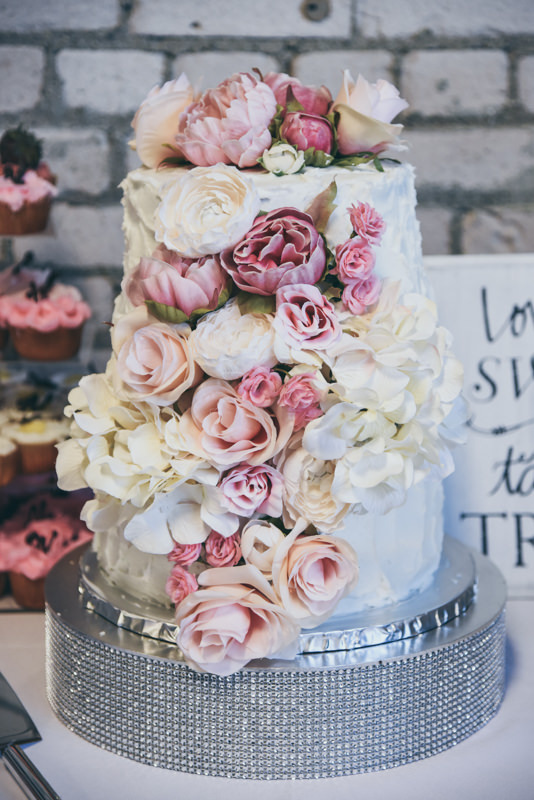 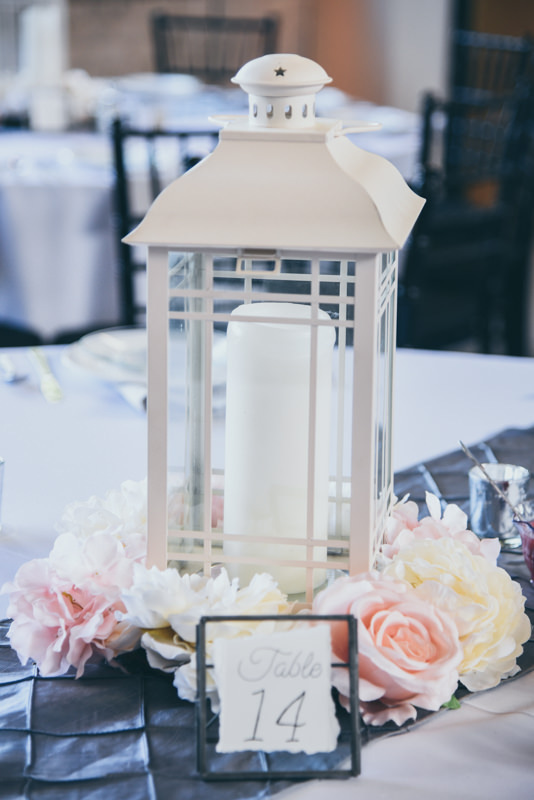 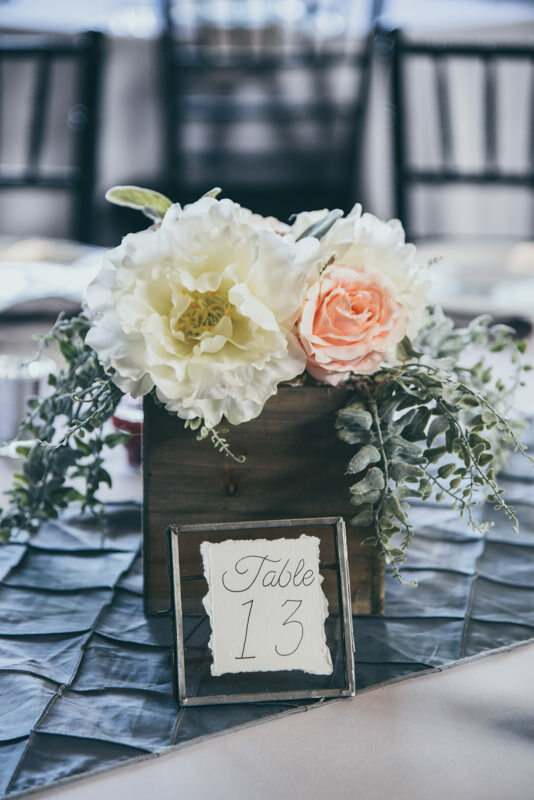 Our floral team did an amazing job setting the scene with fresh roses, hydrangeas and greenery. 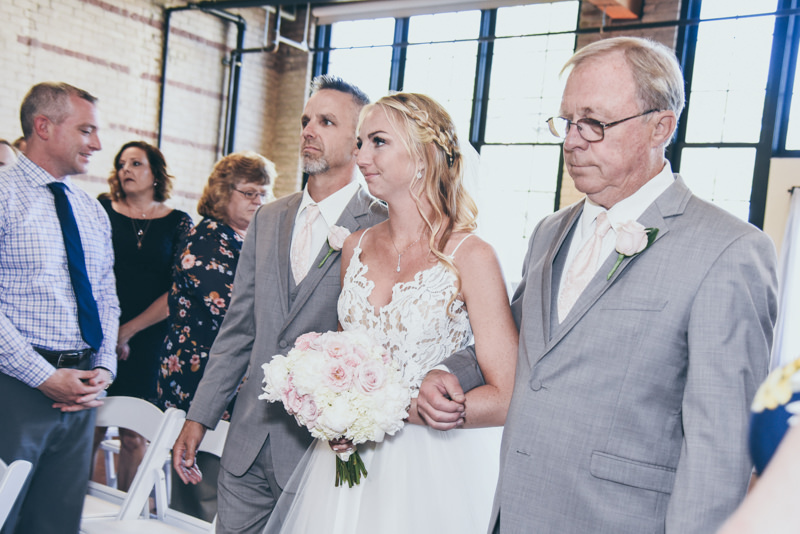 Megan’s father and grandfather walked her down the aisle, which was another unique moment in their wedding. 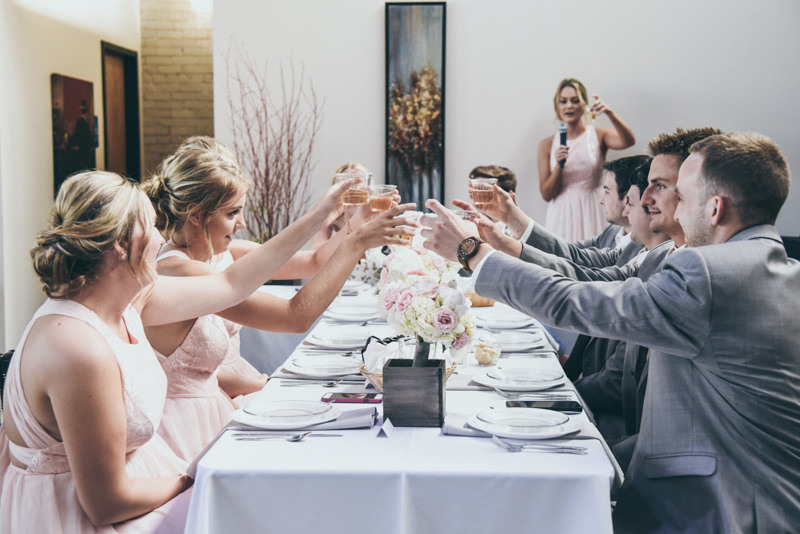 Our staff coordinated things from behind the scenes, and we enjoyed the ceremony and helped to usher everyone over to the dining room for cocktail hour while Natalie and Emily finished up family photos with Megan and Ben. 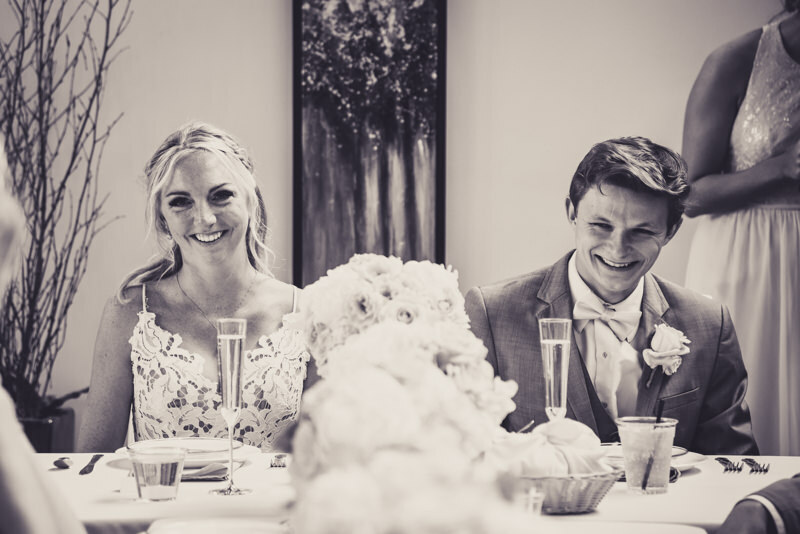 Megan and Ben’s reception was great fun! 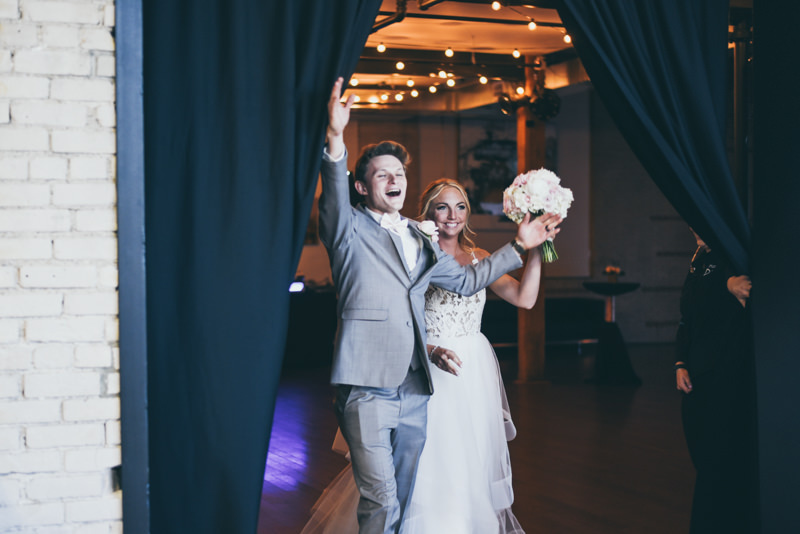 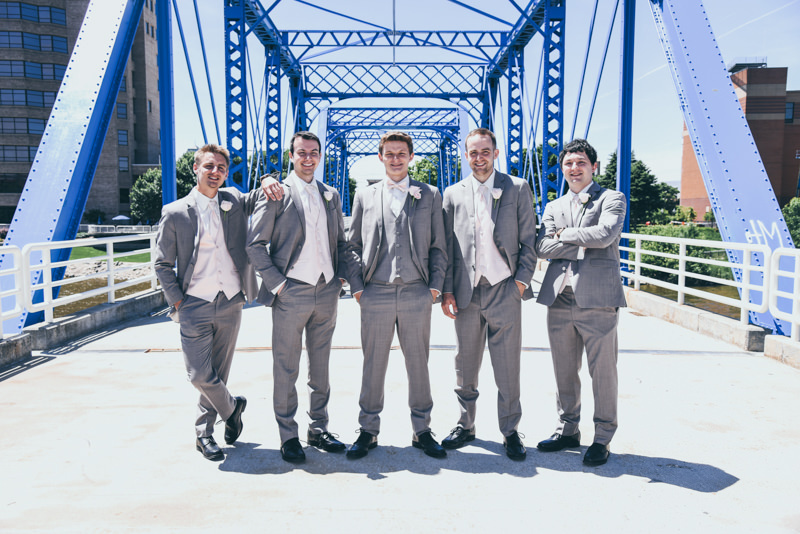 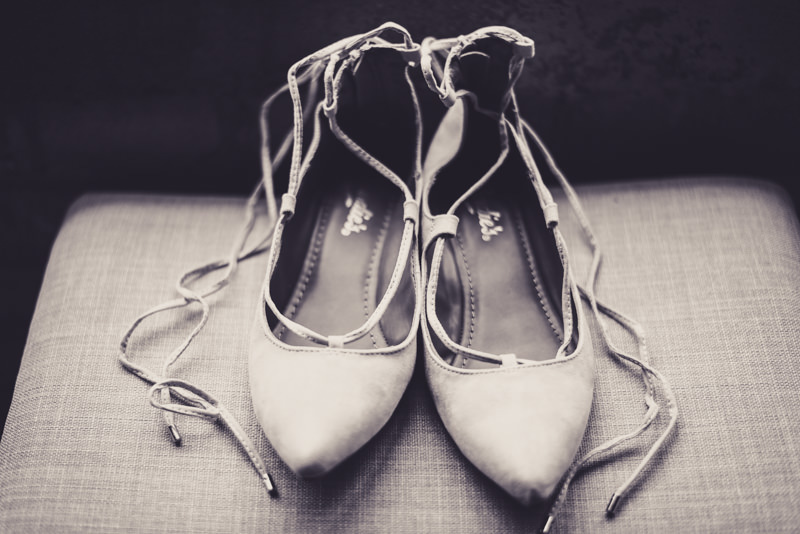 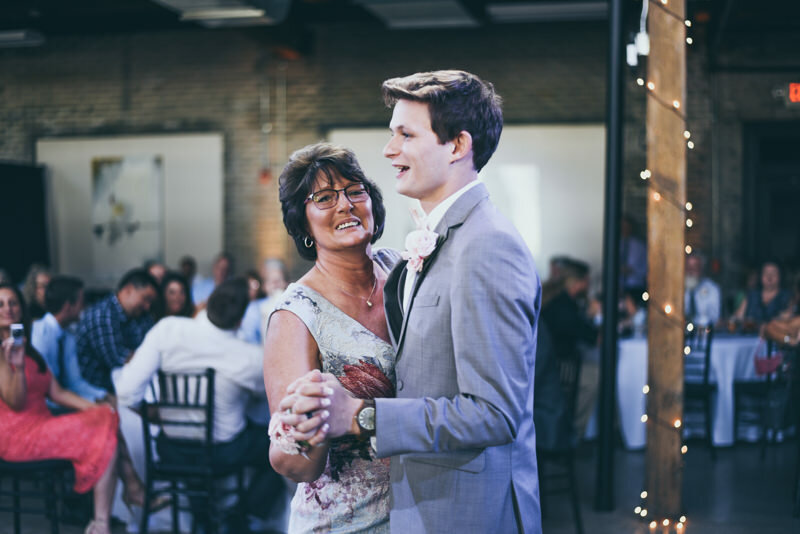 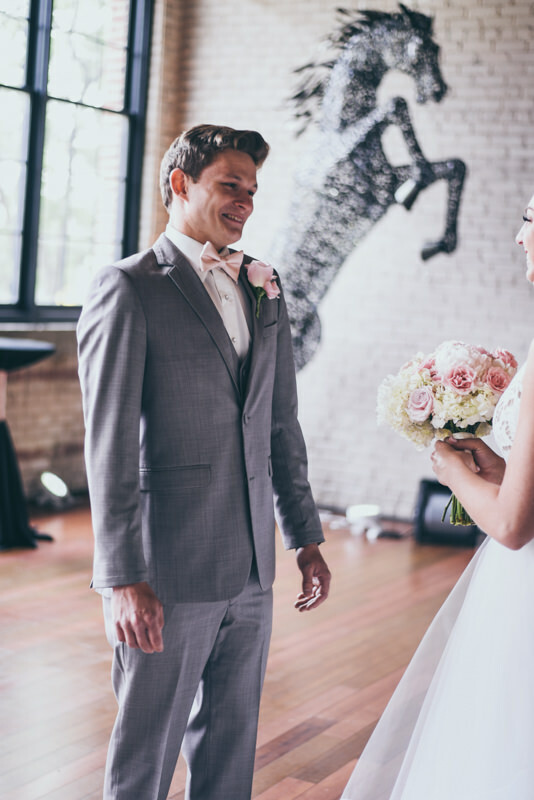 Tons of laughter, lots of line dancing…and hey, even garters on groomsmen! 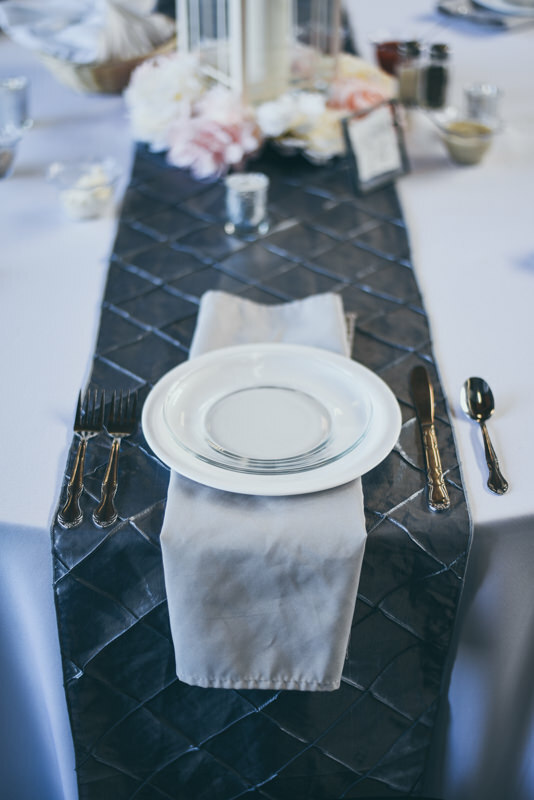 An amazing dinner was catered by Adeline Leigh, insanely delicious (and tasty!) 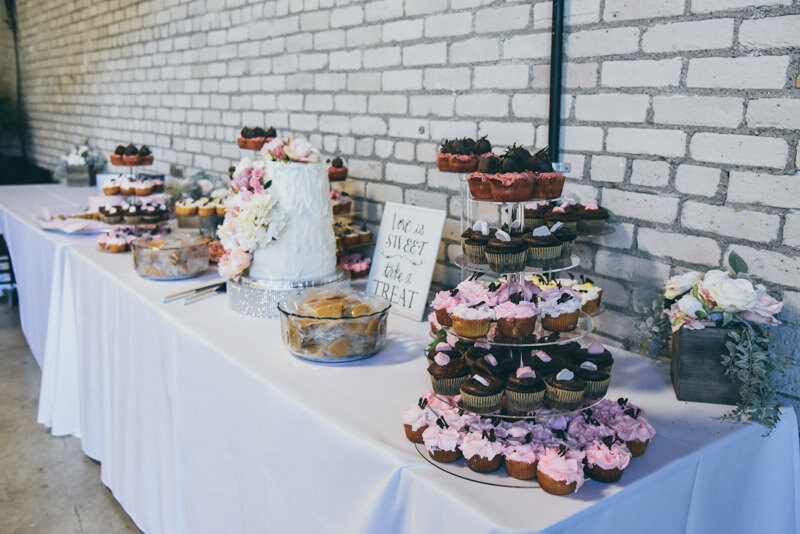 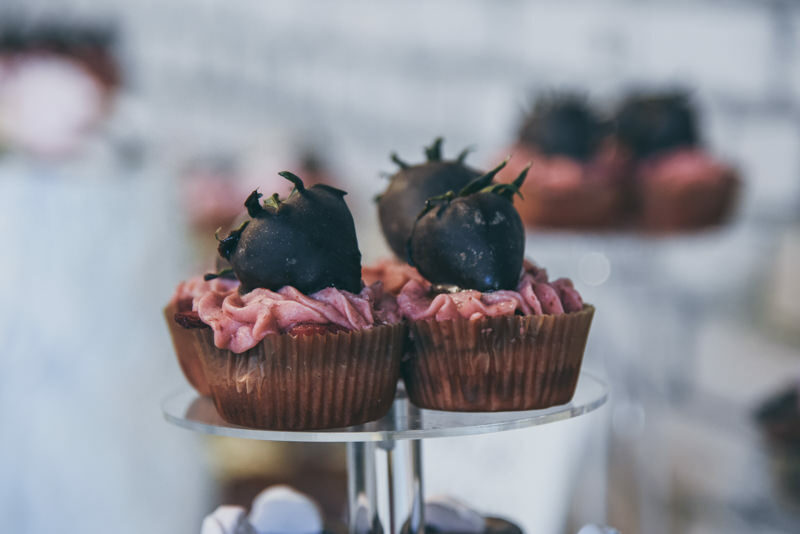 desserts by Paradise Cakes, and a little Late Night Pizza from us! 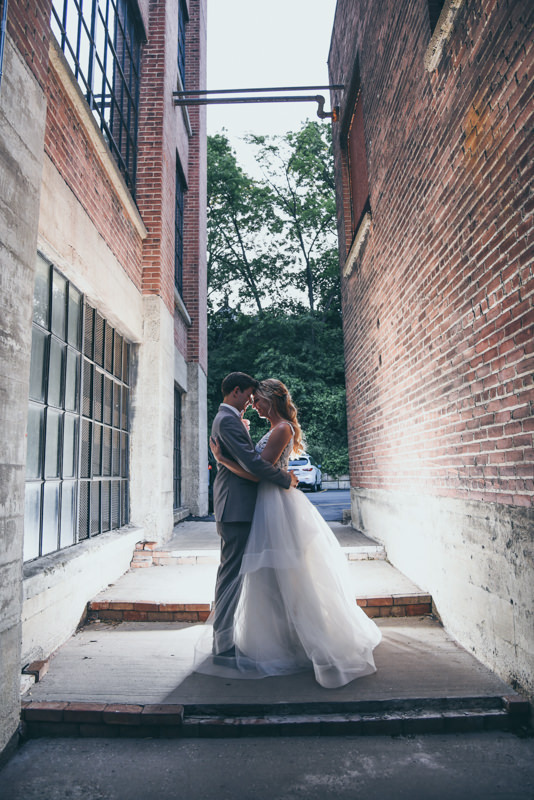 After everyone was dancing and enjoying the party, our photo team took Megan and Ben out for some backlit evening photos before calling it a night. 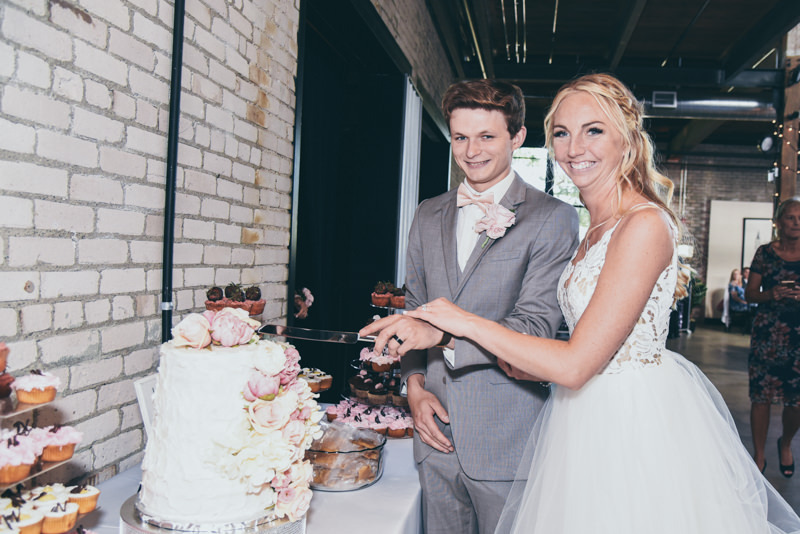 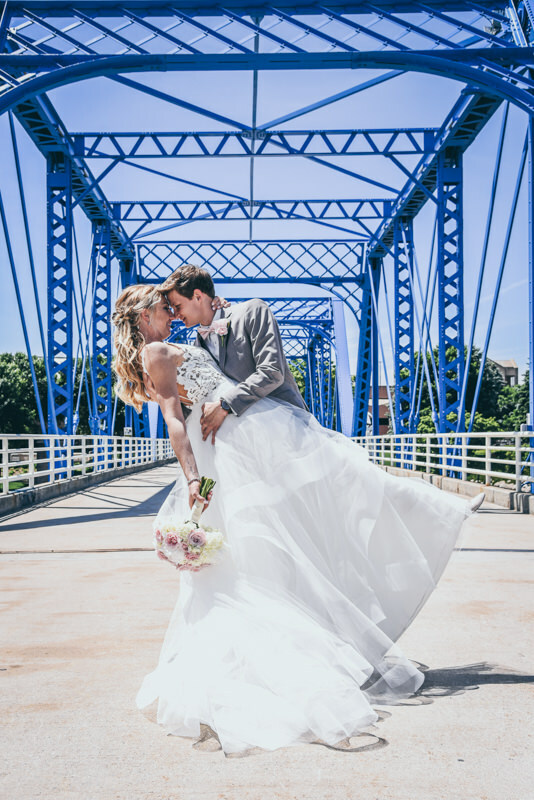 Megan and Ben, we were so thankful to be a part of your wedding day!